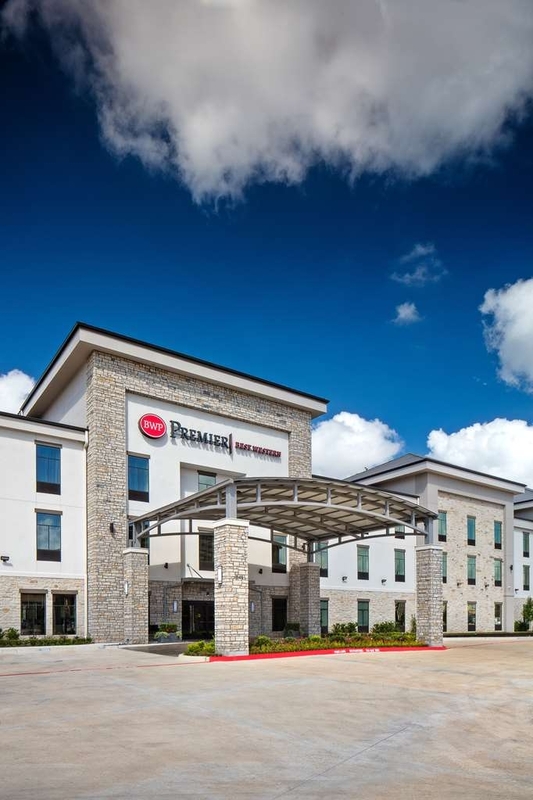 The Best Western Premier Energy Corridor is ideally located in the center of Katy. Come and experience our hotel near the major tourist attractions. Best price guaranteed and exclusive deals. 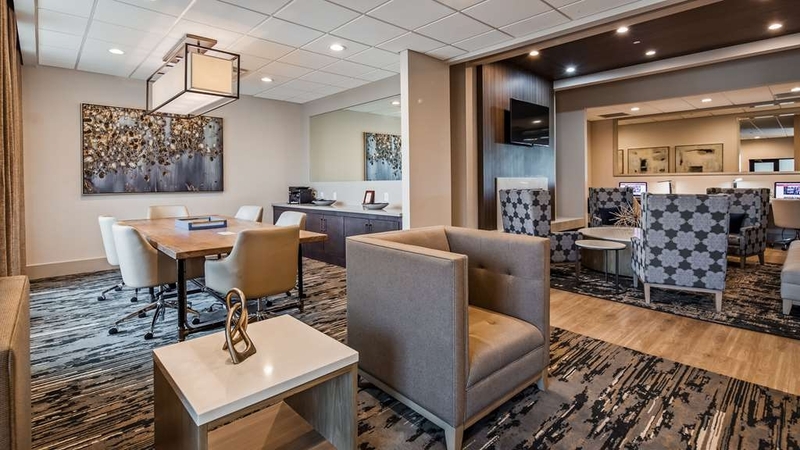 Welcome to the Best Western Premier Energy Corridor! 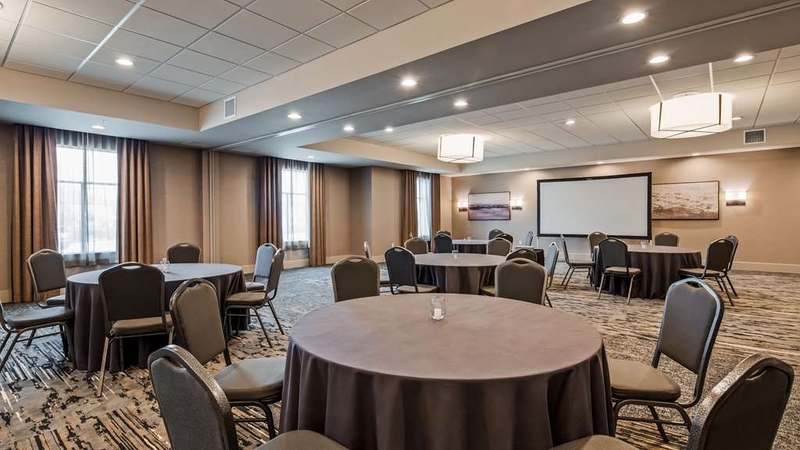 Enjoy a variety of gathering areas throughout the main floor of the hotel for business or pleasure. Winner of Expedia’s Best of VIP Access Hotels Award for North America for 2017! 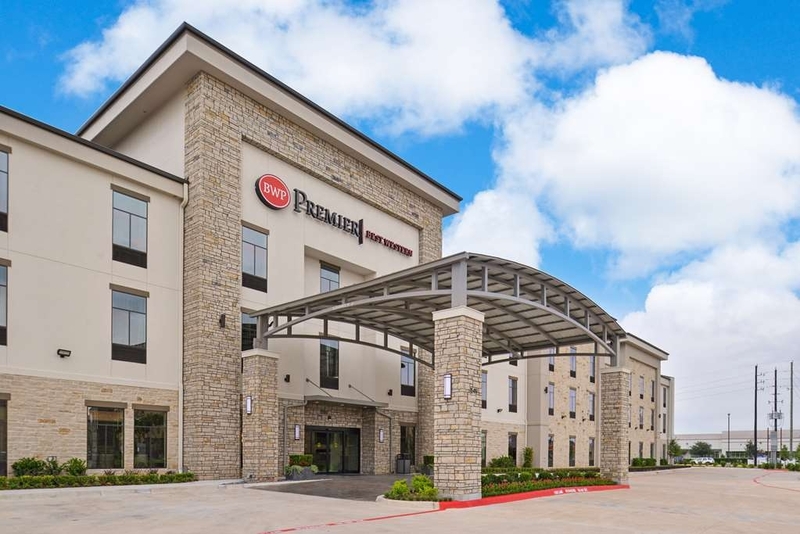 Our newly constructed Premier hotel is centrally located near the energy corridor and Katy, Texas just off I-10. This Premier hotel is part of the Best Western family. The hotel offers a higher standard, refined atmosphere, first-rate amenities, superior accommodations, and service a cut above. 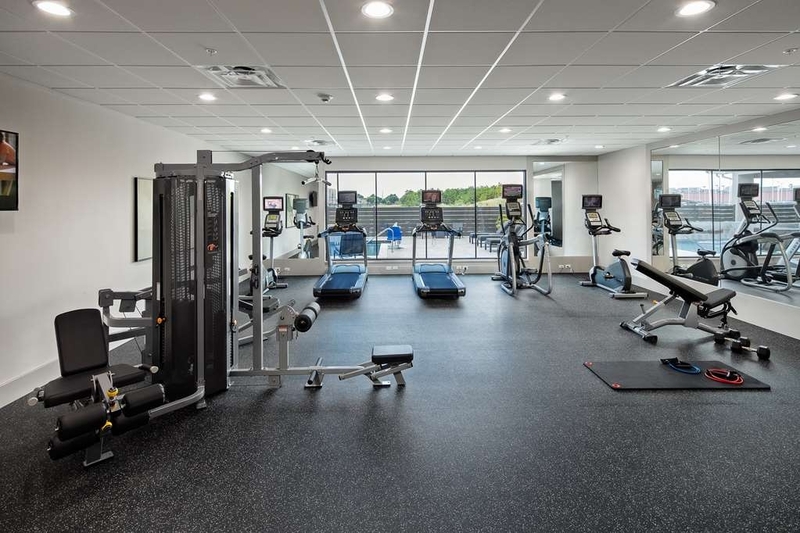 Travelers will enjoy modern features and amenities throughout which include a state of the art fitness center, on-site dining, cocktail bar, and gathering spaces around the hotel. 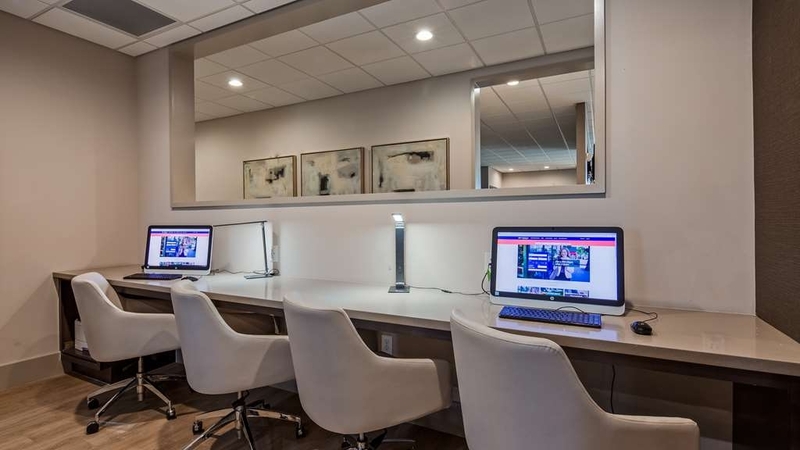 Plus, stay connected during your visit to Houston with complimentary Wi-Fi, data ports and USB access thru the entire hotel. 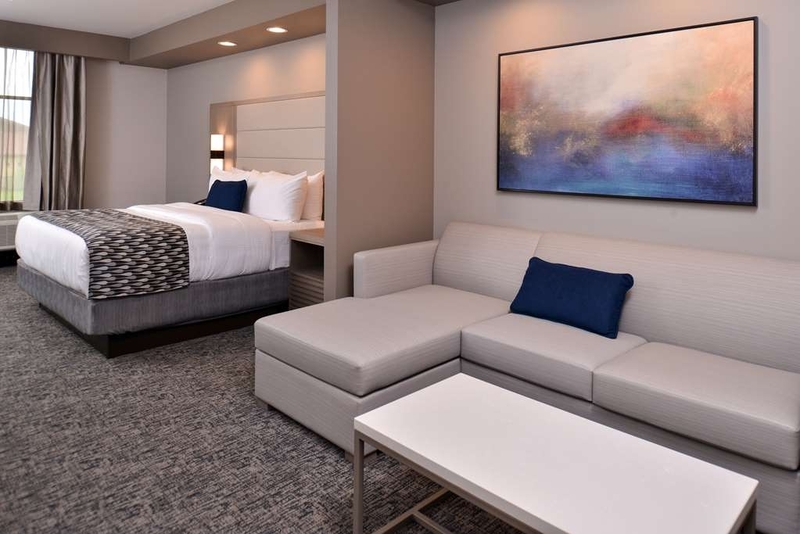 Spacious, upscale guest rooms welcome you with detailed finishes, premium linens, and convenient amenities such as a mini refrigerator, microwave, Keurig® coffee makers, 49-inch flat screen television, laptop safe, and a pull-out sofa sleeper in the separate living room. 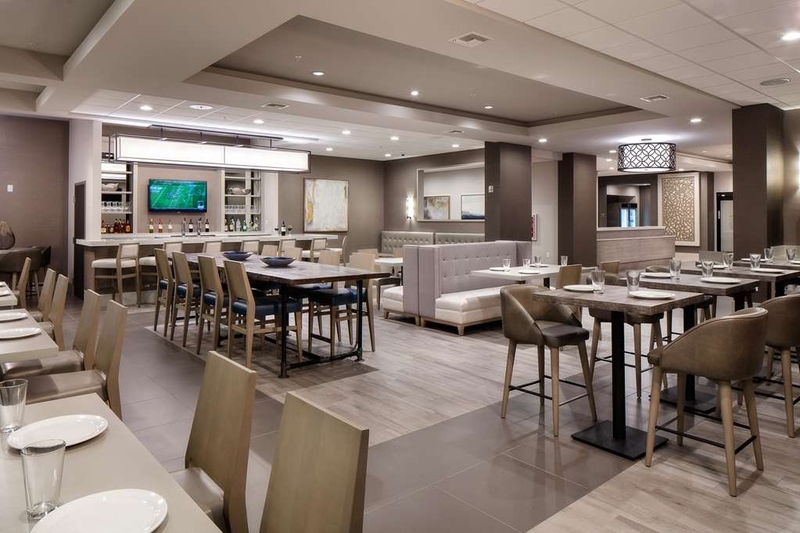 Enjoy our complimentary breakfast buffet includes continental as well as hot rotating items daily, plus a fresh cook to order omelet station. In the evening take a dip in our refreshing outdoor pool with cascading waterfall, and whirlpool hot tub. Our hotel location offers a variety of restaurants and destinations within walking distance or a short drive. Just to name a few Memorial City, Katy Mills® Mall, Main Event, TopGolf, Typhoon Texas Waterpark, and the CityCentre. We are the ideal location for travelers’ visiting British Petroleum (BP), ConocoPhillips, DNV GL, Dyna-Drill, GEICO®, Wood Mustang Group, Shell Oil and Schlumberger. For our extended stay guest, two laundromats on-site. 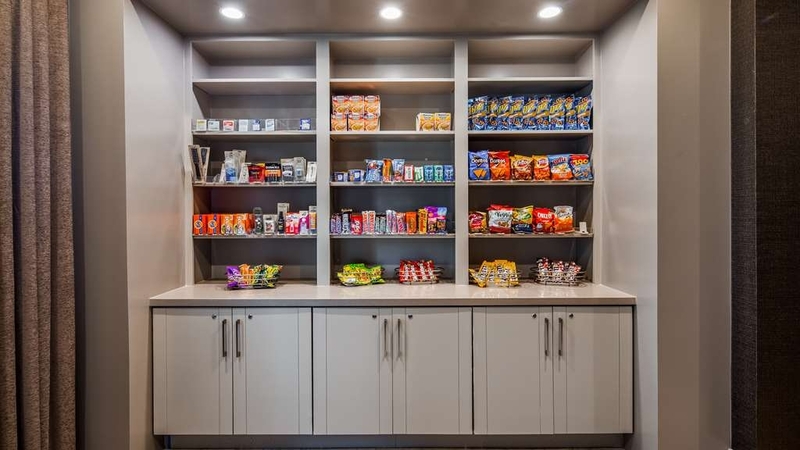 The on-site shop offers snacks, microwaveable meals, beverages, or toiletries. The hotel has 24-hour security. 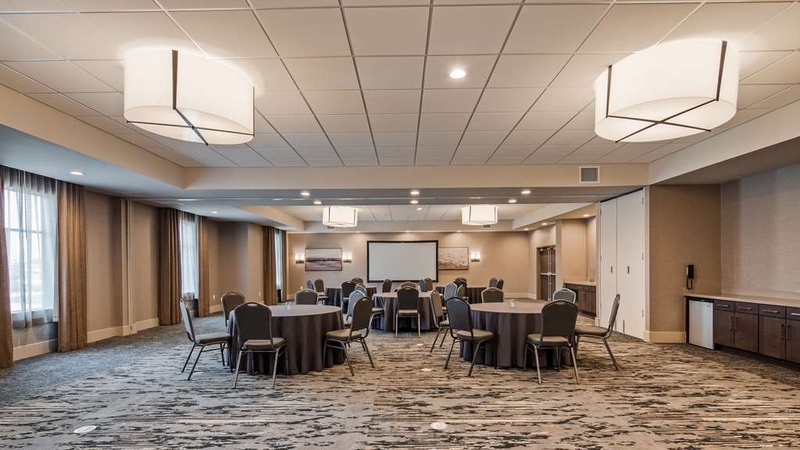 The Houston Premier hotel offers function spaces for business or social, with 2,035 sq. ft. to handle up to 120 people. 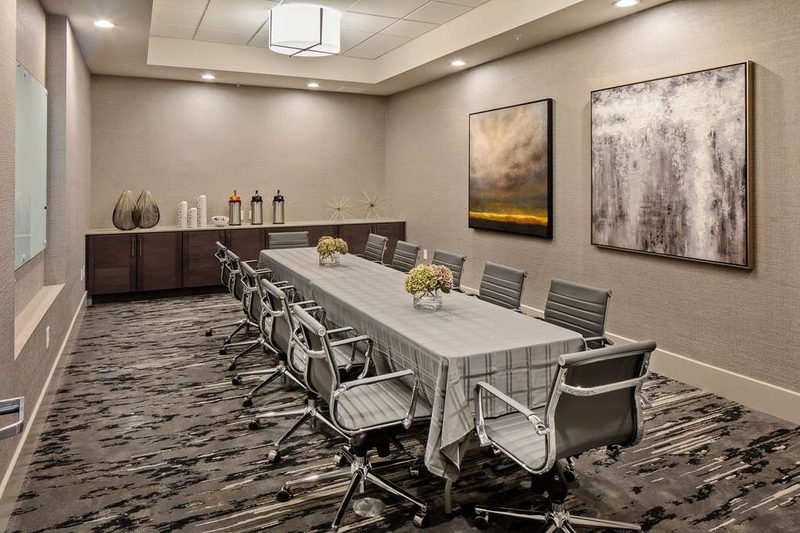 Our boardroom host up to 12 with relaxed seating. This hotel is clean, comfortable, and the staff was exceptional. The bed was a little soft for us, but the King room was spacious and had everything we needed. Would suggest a third floor room so you don't have anyone above you. We didn't hear outside noises, but there were noisy guests, as is always expected at a hotel, but it's still annoying. Also suggest a room far away from the elevator, as our room was right across from it and conversations were easily heard in our room. The breakfast was adequate. Great place. So clean. Staff was nice. Great breakfast! Beds were so comfy! The lounge area is gorgeous and modern. Pool area also niceWill definitely stay here again soon. Highly recommend for the Katy area !!! Omg if you want affordable luxury. 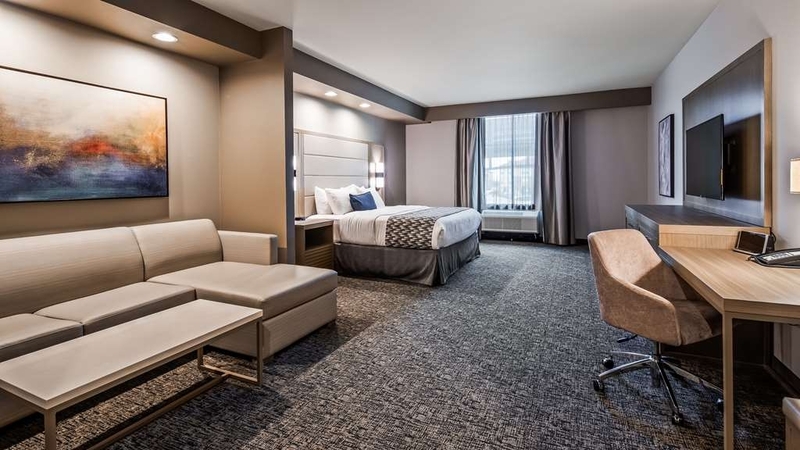 Best Western premium is the place to stay. Very clean. They even had an omelette station for breakfast which was complimentary. The rooms are huge and very modern. The pool Uhhh at night was beautiful you would have thought you were at a resort! "horrible - poor customer service at the general manager level. Never responded to our complaint." Stayed here during my brother-n-laws funeral. Very comfortable and clean They had a good breakfast. They had a waffle iron in the shape of Texas. I would recommend this motel if you are in the Katy, Tx area. Every facet of service, cleanliness, quality, and attention to detail was outstanding! The west-central location made it accessible and the breakfast may be the best I've experienced at any hotel! Way to go, management! I recently stayed in this hotel from 3/8-3/10, and I was very pleased with my stay. Staff were courteous, professional, and they gave service with a smile. I loved my room because it was spacious and the decor was really cool. They had a Keurig, microwave, and a refrigerator in the room. The breakfast was excellent, and I made sure to get a omelet made fresh at the omelet station. I forgot to mention in the closet, there is a iron, ironing board, and a safe for your valuables. The room had everything I needed. I didn't use their fitness center or go to the lounge for drinks, but it was available. I think the lounge is open from 6pm-9pm. They serve drinks and have a small food selection for additional cost. Breakfast was included with my stay. I am single female, and I felt safe in that area. I still used my common sense. Restaurants, Sams Club, and the Katy Freeway are close by so it worked for me. I filled up my rental car at Sam's Club my last night there, and I was ready to leave for the airport the morning I checked out after having another tasty breakfast. I will definitely come back the next time I come to the Katy area. Theis is a newer hotel and it's absolutely wonderful. The room was very nice and very spacious. The staff was very nice and helpful. The price was was great! Close to several places to eat. We have found our new place to stay while in Katy! Very friendly staff, great value, clean amenities comfortable and spacious rooms. Breakfast was included in my stay and many options were available. Pool and workout facility look very nice, did not have a chance to use either. Highly recommended. Awesome bed!!! awesome staff. Check in and out easy. The king size room was very comfortable. The breakfast was hot and good and very plentiful. they also had an omelets bar! not far from major restaurants near Westgreen and I-10. We were in town for a concert. The hotel staff were very friendly. The room was clean, spacious, and had extra bedding stocked. Breakfast in the morning had several options and the food even tasted great! We will be back in the future! Hotel was great it looks just like the pictures! Nothing about it makes it feel “nasty” everything is fresh and nice!! Plus with breakfast included wafles,cereal,different breads, eggs,bacon,sausage, potatoes,omelets! If i have to stay in katy again i will return here! We drove from Dallas to Houston to sadly attend the funeral of a good friend. We had reserved a room in Premier Best Western Energy for one night. However, upon reading the booking details, we found out that the check-in time was 3 pm. The funeral was at 2 pm and we also needed time to get to our room and get ready. We called and explained the circumstances and asked for an early check-in. They listened to our request and once we got to the hotel, the front desk staff accommodated us which helped us tremendously. We attended the funeral and later that night returned to the hotel room. While riding on the elevator, we felt a jolt once the door closed and moving up and made screeching sounds. When in our room, there were some noises coming from down the hall which eventually subsided. I guess the rooms are not as sound protective as we were expecting. We had a good night rest in a comfortable king size bed. The next morning before checking out we went down for breakfast which included a freshly made omelette! The staff were very nice, polite and friendly. Overall a very good experience which we will recommend. I am not sure if this hotel just recently opened but it looks just like the pictures show. I was so impressed with the exterior and the interior. I had a king suite and it was large enough to sleep up to six (6) people, four on the rather comfortable king size bed and the room also had a pull out sofa bed. 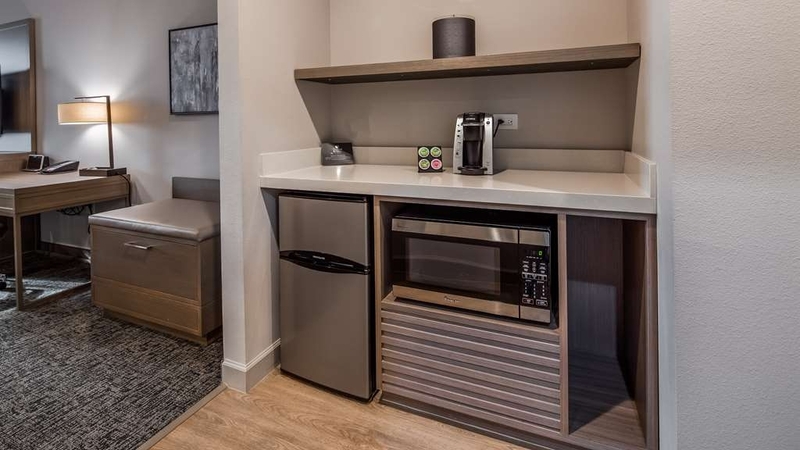 The in room featured a Keurig w/ 4 k-cups and a small pack of Milano cookies which I thought was a nice touch, they had silver and black appliances to give it that more modern feel w/ a flat screen TV looked like it was about 47" and nicely mounted on the wall. I have not seen in any hotels that I have stayed at that looked this modern and have been this nicely laid out. . The area was quiet even for being directly across from an apartment community. The highway is close by and there is a Walmart and other stores less than 2 minutes away. 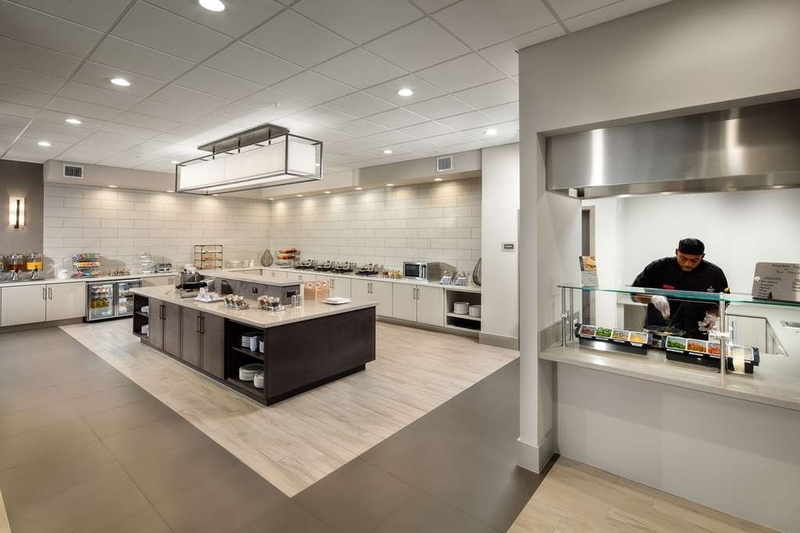 They also offer free breakfast which is fairly typical of most hotel chains but unfortunately, I never got the opportunity to take advantage of having some, maybe next time. I would definitely stay here again and recommend anyone else to as well. "Best kept Secret in Katy"
Great hotel and service. Rooms are beautiful and clean. This hotel is very well managed and I see pride in ownership. The weight room has great equipment the pool is beautiful and the hot tub was very nice. This hotel was very clean and the staff at the front desk and housekeeping were extremely helpful and courteous! I highly recommend this hotel . 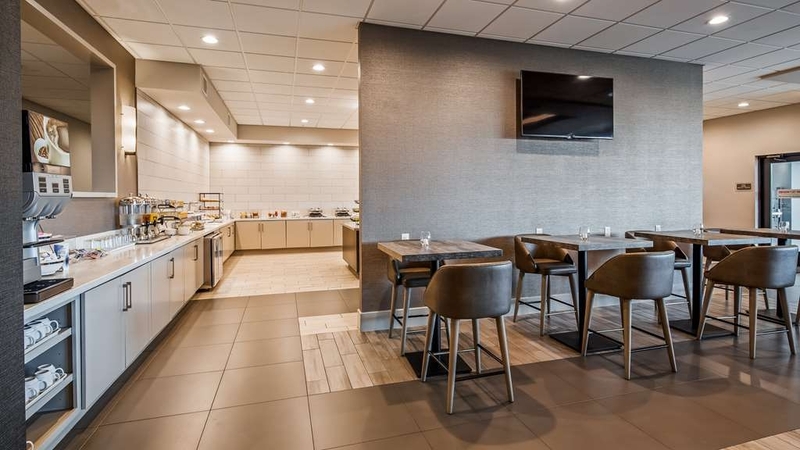 Breakfast is included in your stay and it is conveniently located to the freeway. "Great value! A wonderful stay"
We enjoyed our stay at this fantastic hotel! From the lobby to the breakfast area to the rooms it was all very clean, spacious ... the room was amazing! Large and the bed as at BW's was so comfortable. We had a great stay. Staff helpful and accommodating. Next time we are in the area this will be our hotel of choice. Best hotel I've ever stayed at; especially for the price. Wonderful front desk people Carmen and Ale, they were sweet and helpful our entire stay. Breakfast was amazing , best I've had at any hotel. Will definitely be staying there every time I go visit my family again. Everything about this hotel and staff has been top notch. Minerva is one amazing woman. She has gone out of her way to make our stay here a fantastic experience. Best complementary breakfast in Texas. Thank you for making our stay one we won't forget. We will definitely be back. Wow, this is the nicest BW we have every stayed in! I was blown away by the value we received for this very modern hotel with huge rooms. Carmen at the front desk was very friendly and efficient with the check-in process even though the computer systems were down. She later joined me and my husband for a chat later that evening which made of us feel at home after a few long days of travel. She was very warm and welcoming. Minerva also provided excellent, friendly, prompt service as well when we ate in the café that evening. As we were the only customers in the café, we were able to converse with her as well. We could tell that both ladies really enjoy their jobs and making people as comfortable and happy as possible. Minerva even gave me a hug goodbye when we left the next day! It was nice to have the café and bar available. Prices were a little high but we were happy for the convenience of not having to go out in the cold to a restaurant (even though they were just a few minute walk away), especially after having gotten there later in the evening and having the inconvenience of driving a U-Haul truck. The pillow top mattress and pillows were SUPER comfortable which was also a welcomed feature for us as we had been driving across the US and were very sore from sitting! We didn't want to get out of bed the next morning! The pool, spa, and gym areas are very nice. We received A+ service during our short stay. We were disappointed we couldn't stay another night! This is possibly the cleanest and neatest place we've ever stayed. We were very pleased. The staff was helpful and friendly. Our room was quiet, spacious, and very well appointed. Breakfast was very good, too. This was the worst stay I have ever had at a hotel. We stayed for 4 days. Two out of the four days our room was not cleaned adequately. Bathroom not cleaned, surfaces in entire room not cleaned, trash and empty cups left in room. I have been trying to speak with someone there but have been getting the run around. Don't stay there! 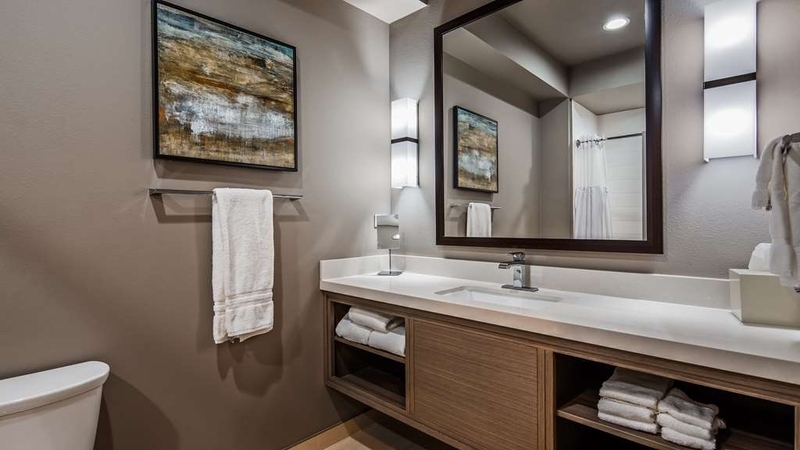 Clean rooms, modern finishes, loads of space, great pricing, and the best staff in Texas. Every trip is the same, each time I am impressed with the attention to customer service provided at every level of the staffing/amenedies. Bar/Cleaning staff is always the best in the business. I have changed my booking habits as a direct result of the interactions I have with the people at this hotel. "Blew my expectations out the water"
I didn't expect to be this blown away! I thought I was getting a very vanilla place however, it turned out to be very modern and the breakfast bar was great! The staff was very friendly! You are getting your money worth's. Ended up staying in Katy for a meeting. Found the hotel on Trip Advisor. Based on reviews and price I chose this hotel. Was very happy with the stay. Room was nice and clean as was the hotel in general. Breakfast was good. Didnt realize there was an omelette bar until it was too late :-(. All in all, great stay. 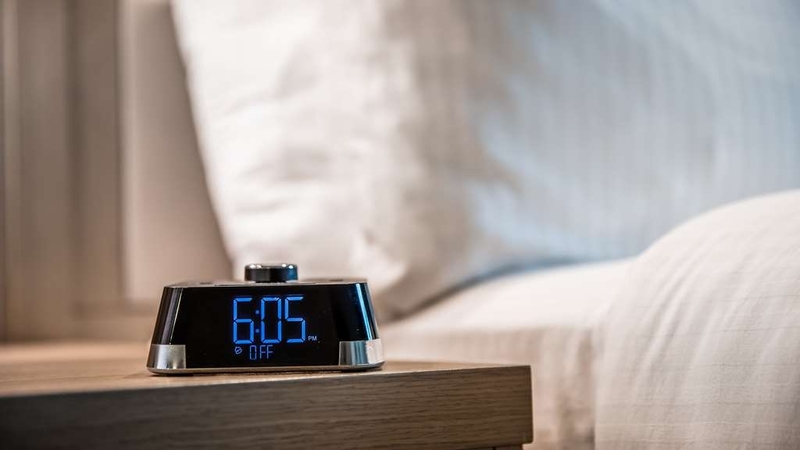 "Clean, friendly staff, Tempur-Pedic pillows and a comfortable bed." I love this hotel! This was my second time to stay there. The staff is so friendly and helpful. So friendly and helpful. It's the only hotel that I do not bring my own pillow too. The bed is so comfortable! Our room had two queen beds and a fold-out couch. This BW Premier in Katy it great. Very clean and modern and the service was top notch. Close to shopping and restraunts. Very comfortable and quiet. We will stay again if in the area. Highly recommended. "Wanted to give 5 stars, but then this happened..."
I stayed four nights at this hotel in Katy during a business trip recently. My first impression was positive, with friendly front desk service, a nice large room with great amenities, and a good hot breakfast. As the week went on, I continued to be impressed by the hotel. The day I left, I was ready to give a glowing 5-star review, and I booked it again for the next week. But then... I was packing to return to Katy and this same hotel, then the day before I was to arrive, the manager of the hotel called me to tell me that I couldn't check in using the same credit card I had used the previous week because their system was being upgraded and that type of card would not work for the next 10 days. I had already booked the hotel and held the room with that card, and that card is the only one I can use for my travel. I asked them to manually call in the card and pre-pay the week's stay - they would/could not. I called Best Western customer service to try to pay them up-front with the card - they would/could not. I cancelled my reservation. 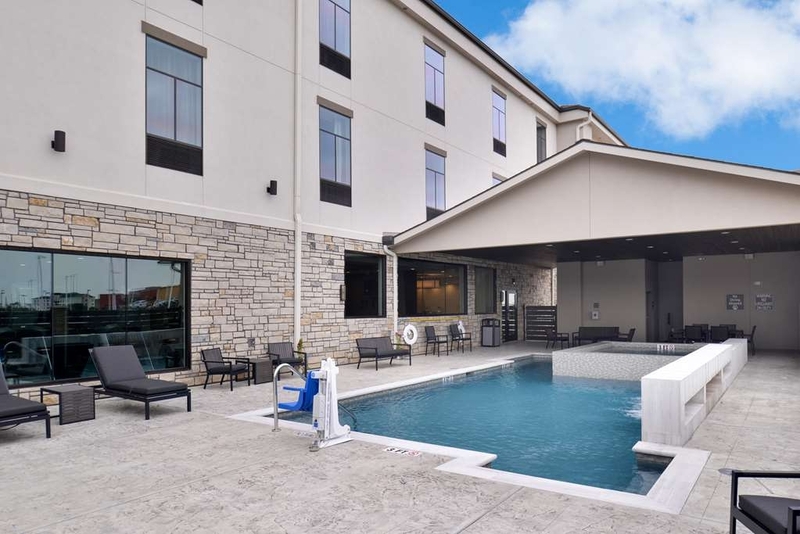 I so wanted to give them a high rating, but unfortunately the last two stays at a Best Western (although generally good stays) both had a flaw big enough for a regular traveler that I will no longer book Best Western hotels. Too bad - they were so close to having a new frequent loyal guest. 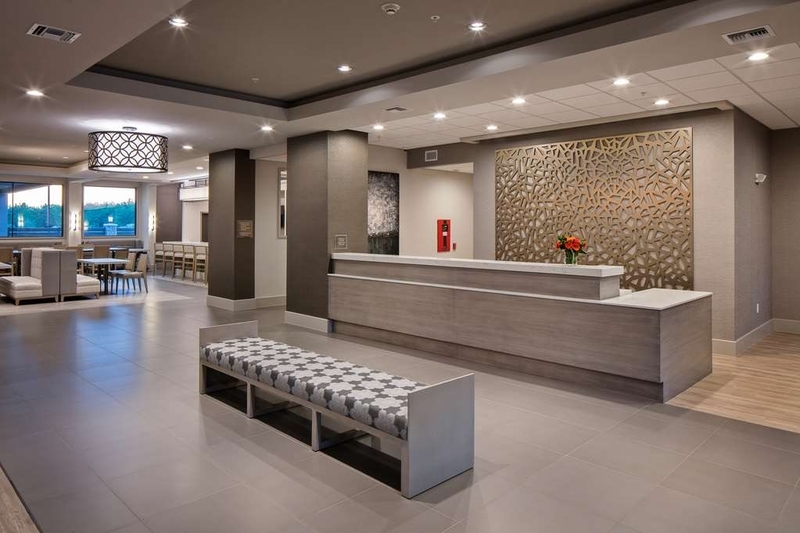 Very modern hotel and exceptionally clean, Location is very good with many restaurants and stores nearby. Complimentary hot breakfast was superb with made to order omelettes if desired. Very pleasant staff. "Excellent Place to Stay In Energy Corridor"
Very Clean atmosphere, Very courteous Staff. The omelette for breakfast was the Highlight. It was worth the money, although a little bit pricey more than other BW.You will know why where you get there. Less than 1 year old caters to business professionals. Sleek modern decor, they had an omelet station with it's own chief to cook to order. The pool was fabulous. Clean with nice chairs waterfall in pool with extra large hot tub.they shock pool every night and use water softener. Skin feels smooth.staff were very nice apple parking. Several large restrictions within walking distance. Room smelled clean beds were comfortable good shower. this hotel has only been in existence for a few years and the building was clean, the staff friendly and the room was perfect. We had been on the road for a few days and hadn't slept that well for two nights, this bed fixed that. "Great Hotel, nice people, great breakfast, The only missing things is NOT QUITE PLACE TO SLEEP !" If you don't mind losing sleep it's a great place to party because it seems all the party animals come there to let off steam and to spend a weekend away in a luxury resort! My experience was in a good place is immaculate but the bathtub water came all the way up taking a shower almost to my knees and overflowing the second issue was those charge stations where the TVs are are right on the backside of where you sleep at night and somebody put their iPad on or left the TV on while they slept and I didn't get any sleep all night! We stayed at this hotel for two nights... The rooms were very clean and large. Check in was easy and the staff was professional and friendly. 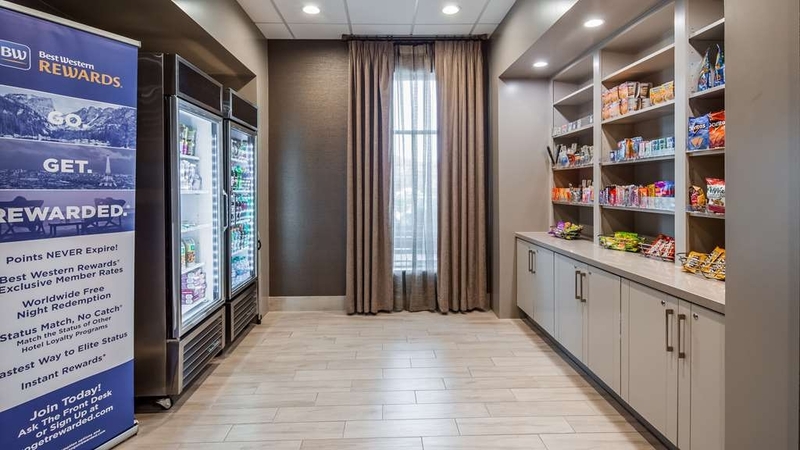 There is a snack store at the front desk with the usual prices for hotel snacks. 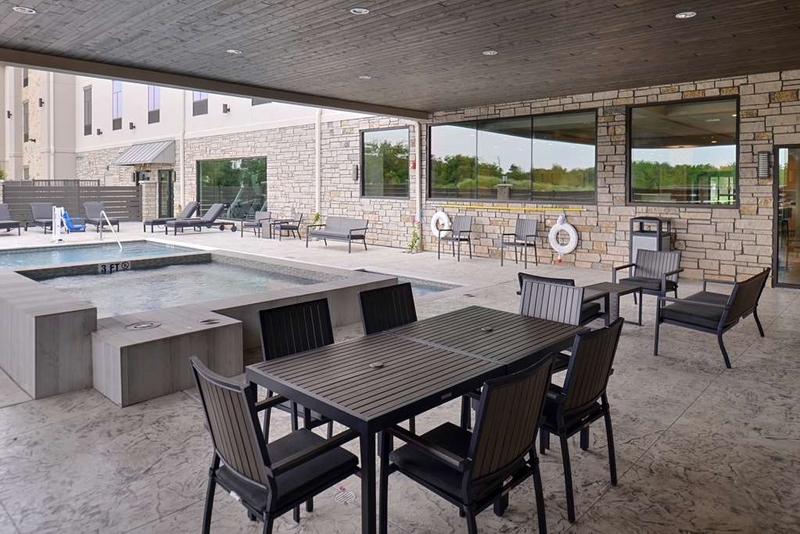 The complimentary breakfast is amazing... waffles, eggs, bacon, sausage, biscuits and gravy, cereal, and even an omelet bar (which we did not try)… the pool/ hot tub area was very clean and well maintained. Overall a great experience and we would stay here again if ever in the area. The staff were very friendly yet professionals, attentive and always looking up to make everything perfect. Rooms clean and well equipped. All the staff always willing and available. Breakfast was awesome.. nicer presented, very well cooked and a lovely service. A beautiful, clean hotel. The room was clean and the employees were all so friendly. It was a wonderful, positive experience. The breakfast was the best I've ever had. There was a guy making omelets. He was funny and the omelet was delicious. I would definitely recommend this hotel to anyone. Awesome stay! I would stay at this hotel again, it was clean and the room size was large and comfortable which was mostly important to me and my family. Any other issues were minor. I would recommend this hotel to my family and friends. Stay was excellent! Room was spacious, close by to stores. Very convenient location. Breakfast was amazing. Our family trip could have not ended any better. Staff was friendly and helpful. Place overall was great! John was amazing! He made the best omelette and was sooooo welcoming. I would def recommend this place to anyone staying in the Katy area! The beds were comfy and the entire hotel was super clean and new. (The complimentary breakfast is super impressive! Hence John makes amazing omelettes). The front desk was very nice and professional. The lobby was very quiet and clean. My room was nice and clean definitely beyond my expectations & believe me it is hard to please me whenever it comes to cleaning. I will definitely stay here again! 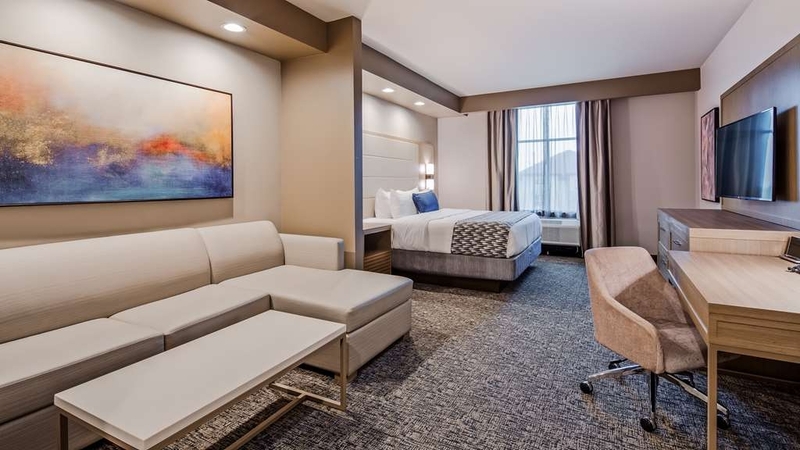 Our Best Western Premier experience for a 3 night stay was very pleasant. Amazing beds, fabulous restroom space and atmosphere. Breakfast should include bottled water and fresh fruit other than bananas. The fresh omelets were a plus though! This hotel is excellent! Very courteous staff, very clean and modern facility and pool area, breakfast was great. I thoroughly enjoyed my stay and look forward to staying at this hotel in the future..
"Why aren't you staying here"
I don't normally write reviews. Actually this is my very first one from the hotel desk. This Hotel is truly an amazing place to stay. From the amazing staff, the BIG spa tub and pool, and of course the comfortable room. I normally have some cleaning issues, but the room was beautiful and the bed was comfortable and everything was CLEAN. There is a real microwave and mini fridge. Yes a real one that you can actually put food in, not those crappy freezers that can only hold one or two cans of soda. Heck, it even had a marble table that took two of us to move. Not those cheap flimsy ones. Thanks all for your service, great pool, and clean and comfortable room. I am definitely coming back when I visit Houston. My husband and I stayed here while visiting family in Katy. The hotel is super nice, great staff, delicious breakfast with nice pool and workout room. The bed was super comfy!!! We will definitely stay here any time we come in town to visit with family!! "Wonderful property and fabulous staff." Newer property. Staff was friendly and property was very clean. Easy of and off freeway access except don't follow the gps was it directs you through a residential area. Nice pool area. Bar is open until 9 and meals/snacks can be purchased at the bar. "Minerva was such a great and welcoming person!" We stayed just overnight, and the breakfast was amazing, Minerva ran the breakfast so well, making whatever kind of eggs your heart desired, she was very sweet and did her job very swiftly and made all of my family feel welcome. Minerva made our stay even better than it already had been! Very clean and very comfortable. the rooms are very roomy and neat. We loved our stay. We loved our Minerva. 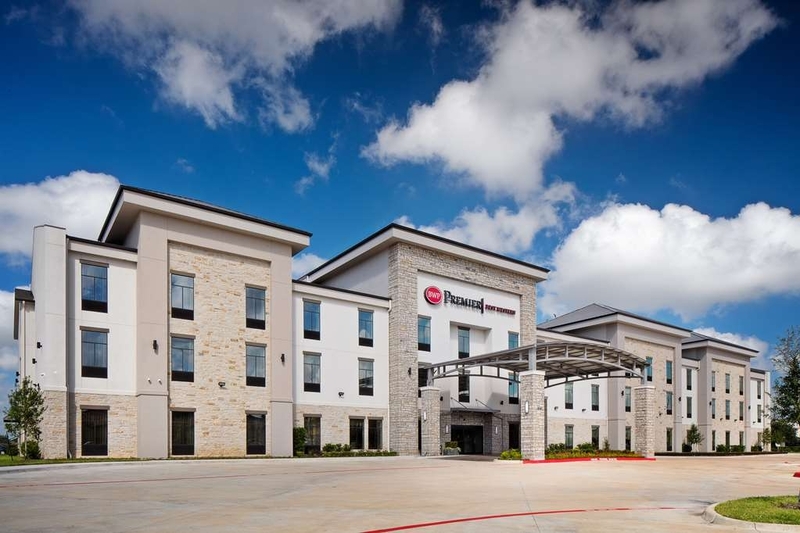 I booked this hotel for my trip to Houston, but even though the hotel is in Katy, TX, it did not bother me one bit to book a hotel in Katy. I really loved Best Western Premier and will continue to book at this hotel for all of my trips to Houston. The hotel is very clean on the inside of the building and the exterior. The hotel was very easy to find and is conveniently located closeby to restaurants. Every staff member I interacted with was very pleasant and showed great hospitality. The rooms were very nice and very clean, the beds and bedding were very comfortable as well. Everything about my hotel stay was truly excellent and I will certainly make this hotel my only choice whenever I am in the Houston area. Best Western Premier Energy Corridor This hotel was pleasant and comfortable to stay in with my daughter. We enjoyed the service, the breakfast, pool and overall location! I am sure we will stay here again sometime in the future and probably more than once. This hotel was pleasant and comfortable to stay in with my daughter. We enjoyed the service, the breakfast, pool and overall location! I am sure we will stay here again sometime in the future and probably more than once. Great hotel experience from the start! Great room, great food, great service. Minerva in the lobby running the breakfast is the best! Wish I could have her at every hotel I travel to. Great place, great people! "Hotel for the 21st Century Traveler"
This hotel is super modern and is on the cutting edge of providing the best stay we've had in a long time. Super staff, excellent breakfast, super clean rooms, well designed building, top of the line gym, beautiful pool, etc..... I can not say enough about this hotel!!! Love it!! "Beautiful place & Friendly staff!" Stayed overnight during a business trip. This is a newer hotel and the interior of the place was beautiful and very clean. The rooms are very spacious and have that “NEW” smell. The staff here was exceptionally attentive to my needs and were very friendly. I ordered a salad for dinner and it was fresh and delicious. You will love this place, this hotel is a must stay if near this area. Great service! Lou in breakfast was very polite to my daughter and I! He made sure we were satisfied with our food and even offered to make us something that wasn't out that day since we are very picky eaters. "Surpasses Any Hilton or Marriott I've stayed in! " I'm honestly blown away, this Best Western truly surpasses any Hilton or Marriott I've stayed in!! 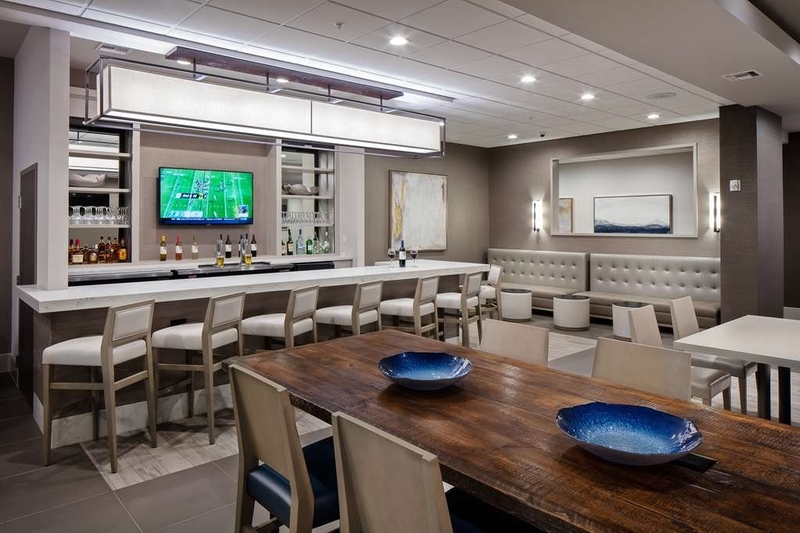 I'm a frequent traveler, and was impressed by the beauty of the common areas and suite, the staff goes above and beyond for you!! Breakfast was phenomenal!! Minerva is an absolute joy and ray of positivity! We even met the kitchen manager, Anthony, who also came out to meet us. If you have an opportunity to stay here, I highly recommend you do! we only concern you'll have is how any other hotel will hold a candle to this one! I stumbled upon this hotel while looking for a place to eat. This location is beautiful and the staff members are friendly. Although we travel often, it was my first time staying here, but it definitely won't be my last! I saw this hotel being built. It is beautiful inside and clean! Our check-in experience was simply fabulous. They young lady was attentive and quick. Our guest room was beautifully decorated and still had that "new" smell and has a microwave and refrigerator. Breakfast was pretty good- there is an omelet station. I would have given the hotel 5 stars however I found a very long strand of hair in a towel I was about to use and also additional ones in my bed. Within walking distance there is a BJ's Restaurant and Texas Longhorn. Katy is a very nice area with a Wal-Mart close by and several other places to eat. Also, if you need to get to a mall- Katy Mills is about 5 miles West on I-10. When you walk in the hotel you are greeted as tho you are family, and then when you enter the room it was WOW! The rooms are so big and spacious, very nice and clean. I would recommend this hotel anytime I am in Katy. Rooms are very spacious. Pool, hot tub and pool area is inviting. Omelet station at breakfast is a BONUS. Lots of parking. Super friendly and helpful staff. See ya all next year!!! Convenient location. This hotel is absolutely wonderful! 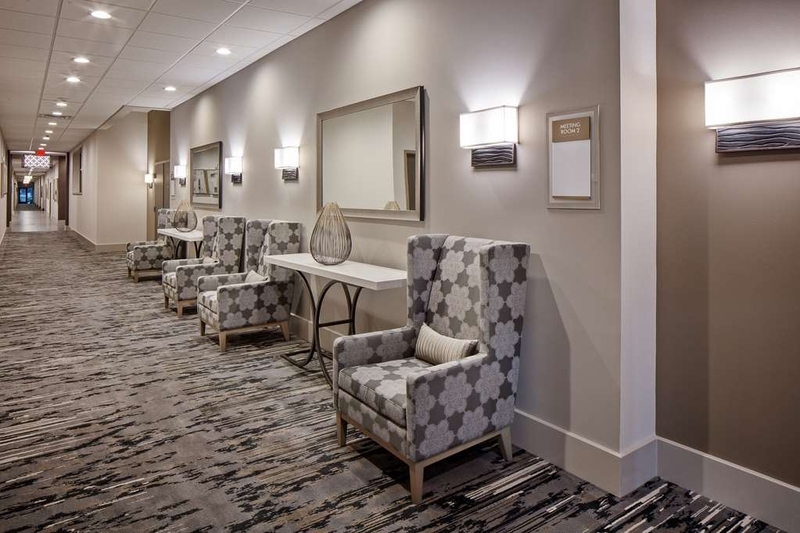 Great location and within walking distance or a short drive to many restaurants, it's nice and clean, and the people there are so friendly, going above and beyond expectations to ensure the most pleasant stay for each of their guests. The rooms are very spacious and furnished with the most comfortable beds for a good night's sleep. The breakfast, which also includes a made-to-order omelette station, is amazing and available at no extra charge. The hotel also has a bar, which my husband and I took advantage of later in the evening. There we met Minerva Maldonado, who provided us with good drinks, excellent service, and wonderful conversation. Highly recommend this hotel! 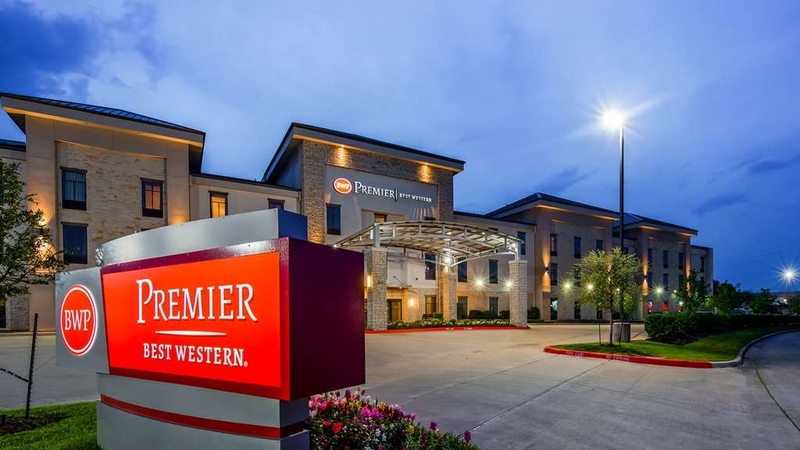 "Best Western Premier Energy Corridor Katy Tournament Trip 567033284"
Best Western Premier Energy Corridor Katy Tournament Trip 567033284 Very nice hotel with excellent staff. Stayed here while attending the Southland Conference basketball tournament in Katy. It was about a 10 minute trip to the Merell center, which was not a bad drive. Lots of eating places located very convenient to the hotel, from fast food to sit down dining. This was by far the best hotel experience I've had in a long time. First impressions are what count and it's first impression, which is the lobby, was very pleasing to the eyes. The smell was great too. Now the breakfast is worth every penny for the cost of the hotel. The staff are pleasant, helpful and remember what you order from one day to the next. They make omelets to taste, have bacon, sausage patties and links. Muffins, bagels, croissants, yogurt with toppings and then you can make waffles with toppings too! I'll definitely be staying at this hotel again! You'll check out the other competition but you won't find the price and breakfast match at any other one. I stayed at this hotel with some friends for a conference we went to in Katy. This hotel was very clean, the people were nice and helpful. We had a wonderful breakfast which included just about anything you can imagine. I would definitely stay there again! This hotels is fairly new and rooms are in very good shape. The staff was polite and welcoming. Rooms are pretty and equipped with keurig coffee machines. The rooms that are on the street side can get really loud at night due cars racing down the road. The pool area is very pretty and the hot tub is huge. I really don't have anything negative to say about this hotel. If one thing that would be the breakfast. Don't get me wrong the breakfast room and the staff there are excellent. It just felt a little "naked". The warm potatoes were cold and the election of toast was very poor. Maybe adding some real nice toast and bagels would make this better. Appearance of hotel was new, clean, &stylish. Room was spacious. Free breakfast consisted of too many items to list, but included both bacon & sausage, waffles & an omelette bar! I will definitely stay at a BW Premier next time I travel. So far the best hotel I have ever stayed at. It was clean, comfortable, and fun. This hotel has everything you would want. From large rooms to fun pool area. Service was over the top nice especially the bartender, Minena. She was a delight. We were more excited about our hotel then anything else on the whole trip. We have already booked the same hotel for our next two visits. Definitely worth it!!!! Since this hotel was new, all the furnishings were were clean & comfortable. Had great night sleep on their mattress and enjoyed a delicious complimentary breakfast. You can have your eggs or omelettes made to order Minerva was especially accommodating on the evening shift and made a very good drink (would have been perfect if they had Jack but had to settle for Makers Mark) in their bar/grill area. Menu was somewhat limited but we all had something we liked from grilled chicken breasts w/veggies to salads to hamburgers. Hamburgers were prepared from fresh and therefore took longer to prepare than fast food burgers. Best spinach artichoke dip I've tasted. Our stay was for wedding party. Excellent beds, extremely comfortable. Very spacious rooms. extremely clean. Excellent breakfast, very neat and tasty. staff were very professional and attentive to our needs. 5stars hands down. The two queen room was larger than expect w/ loads of storage. Wait staff throughout went above and beyond to help and were extremely friendly! Great breakfast in the am including made to order omelets. So happy with our stay this spring! The lady Minerva in the breakfast area was absolutely the best, she made everyone an omelette to their liking, she was very nice and caring. She took time to visit with every guest and made them feel welcomed. Took the time to clean up and kept the kitchen area cleaner than ever! Antonio was also very sweet and helpful!! The hotel it's self was very clean and taken care of, the staff was friendly and welcoming. Over all we were very happy with our stay. Excellent location! What you see in the pictures is exactly how the hotel and rooms looked. This is the best hotel we have ever stayed at. No problems at all. Every employee that we came in contact with was very friendly and asked us if we needed anything and how our stay was. 5 Star Hotel!! Very nice hotel with excellent staff. Stayed here while attending the Southland Conference basketball tournament in Katy. It was about a 10 minute trip to the Merell center, which was not a bad drive. Lots of eating places located very convenient to the hotel, from fast food to sit down dining. This hotel is great. The rooms are spacious and very clean. The staff are very nice and helpful. My kids enjoyed the pool. Breakfast is good and the omelets are wonderful. If you need anything Minerva will help. All ways a smile and a good morning. Stayed here 2 nights ago. beautiful rooms and amenities. Staff is very friendly and helpful. Rooms very spacious and very nicely appointed rooms. Very nice pool and hot tub area. Lots of restaurants to choose from close by, and this Hotel is easy to get to from the freeway, but not so close as to be noisy. I have stayed in many hotels and this one in the front pages in my books. The Best Western Premier far exceeded our expectations! The hotel is nearly brand new and very well appointed. Excellent location and HUGE rooms. If you like extra space and superb service this is your place quit looking. You have found a winner in this hotel. The breakfast was solid and the bar was a nice touch. Minerva was so helpful and accommodating at the bar and restaurant. Thank you for hosting us so well. This Hotel was great. It is fairly new and in very good shape. Everything clean. They have better than average toiletries and have Keurig coffee makers in the room. The rooms are spacious. My only complaint is the bed was a little hard, but you can make them perfect for everyone. Very nice hotel, very clean, spacious room, good wifi, and lots of TV channels. I would like to rate 5, but I couldn't sleep due to other guests noise. I could hear the noise from the next door room around 3 a.m. to 4 a.m., also footsteps pacing the floor from the room above at night and early morning . Sonia, who made our omelette was amazing! Her costumer service etiquette was awesome! I highly recommend this hotel! I had just checked out of a hotel that wasn't up to quality standards and was so tired and then I found this place. Its in a great location to get on the highway and the place is extremely clean. There are many food options on the I10 access road as well. Excellent Hotel! We were so impressed with this hotel. It was extremely clean, and the staff went above and beyond to be friendly and helpful. The rooms are very spacious, and the toiletries are nice. They have the best free breakfast we've ever seen at a hotel, including made to order omelettes. What really set it apart was Minerva and John. We so enjoyed being greeted by their friendly smiles every morning. We will definitely stay stay here when we're back in the area. The stay here was absolutely amazing. The hotel is beautiful and the staff was so nice and courteous. The breakfast was also very good you can even get omelets made to order. Will always use this hotel when we need rooms. "Best bar service in town"
In town for a few days on business and had a few cocktails in the evening. I had the pleasure of being served by Ms. Minerva who was very friendly and professional. She really made my evenings at the hotel very enjoyable. I would advise anyone in the area to stay at the and pay Ms. Minerva a visit in the bar. A must stay if you are traveling in the great Houston area !!!!!!!. Outstanding location for business meeting or pleasure. I normally do not give reviews but this location got my attention after the first night. Trust me it well worth it ?? Outstanding job team see you next time . our hotel stay was a welcome surprise after a long day on the road. The room itself was spacious and well appointed, including sofa and table, spacious desk and microwave/refrigerator. We got a great nights sleep in this one-and-a-half year old hotel. The service was exceptional. Ainevua welcomed us to the modern dining area and complementary breakfast bar. She made custom omelettes for us and waffle iron waffles. The pool and jacuzzi are beautiful. We highly recommend this hotel. One of the prettiest hotels I've been in. Staff was vey friendly and hotel was exceptionally clean. I can't say enough about the breakfast buffet and the kitchen staff ! They were amazing and ready to help and serve you anything you may want or need. I highly recommend this place . My friend advised me about this hotel. The hotel is excellent in every sense. The services are available, the service is fast and all the staff are excellent and friendly The food and drink are available 24 hours The rooms are large and clean.I thank Mrs. Matilda and Mr. Adam and all the staff.The hotel deserves more than five stars ????? ????? ???? ?????? ?????? ????? ??? ???? ?????? ??????? ?????? ??????? ????? ????? ???????? ??????? ??????? ?????? ??????? ????? ??? ???? ?????? ????? ????? ?????? ???? ?????? ??????? ?????? ??? ????? ???????? ?????? ????? ???? ?? ??? ???? "This is not the way I remember Best Western. A great experience "
In its class this is a 5 Star Hotel. It's new and its design details are to be commended. The rooms are big and very well designed. Lots of outlets, big tv, great bathroom, wonderful bed. You can't ask for more. I will look forward to finding more BW Premiers. I enjoyed my extended stay at this property back in November 2017. I stayed for over a week with 2 rooms. Ali, Minerva and Chandre were all the best. These three made me feel at home throughout my entire stay. This is my 5th stay at this hotel and it never disappoints!! Clean rooms, great staff. Thanks for making my home away from home very pleasant. BTW the breakfast bar is really good and tonight I got a salad made fresh by Minerva. Thanks again!! This hotel was excellent. The room was very spacious and clean and had awesome amenities. You'll find that the hotel is close to a lot of local restaurants and different things to do. The hotel staff was extremely welcoming during my visit. From the lady at the front desk to Minerva at breakfast and the bar. I didn't catch the name of the front desk employee but she remembered myself and my colleagues each day, even knew what room one of them was staying in when she locked herself out of her room. Minerva made my stay. Constantly I found her going above and beyond to accommodate myself. She always had a smile on her face and constantly made me laugh. During my entire stay she remembered who I was, and when I was late to breakfast she was asking my colleagues where I was. Truly an asset to this hotel team! Every staff should have 10 Minerva's. My next trip to the area I will hope to have the opportunity to stay here again! "Comfortable but needs to fine tune"
Friendly staff, room was comfortable. Needs to staff bar and "restaurant" which is not actually a restaurant, but a staff member who could go make 3 different simple items if you tracked her down to do it. There was never anyone tending bar. She was actually running back and forth with a laundry cart when we were there. She offered to come back and assist us, but we went out as it was obvious they pay no attention and are just picking a random staff member to fill in when there is a customer. Which there isn't because the bar was always dark and no one there to staff it. Had issues with my reservation and while the staff was friendly, they could not resolve the issue. "excellent hotel- would recommend for sure"
good hotel, rooms were huge. nice comfortable bed. Breakfast was good. The person who works in the kitchen (Minerva) was very helpful and friendly. She also helped my daughter to make waffles for her. She gave us excellent service.. very welcoming. wonderful hospitality. pool hours could be better, little disspointed. Could not use the pool as it opens at 10am. Had to leave for the airport at 10:30am. Minerva provided us with excellent service during our stay. She offered breakfast service and treated my mom with ultimate care!!! Great employee ?? I will surely return to this hotel!! Stay was made like if I was at home. My sons were made to feel right at home. They enjoyed the gym and breakfast. Thank you for the service!! "Amazing place with a caveat"
Had a great experience. Staff very friendly , helpful, rooms are awsome great beds. Moning breakfast excellent staff very helpful, great selection of food items omelets are great. Kids love the hotel, we will be staying here when in Houston time and time again. "Clean, great staff and excellent service & bargain"
Great hotel! You'll enjoy it very much! Breakfast is over-the-top, great service, rooms are very big, very clean. Lou and Amber make breakfast a pleasure--great service, much pride---this is a "go-to" location when visiting Katy, TX. One of the best hotels to stay in the area. The staff was very courteous and professional.The front desk lady named Alejandra deserve a special mention. She was exceptionaly courteous and professional in her hospitality. Another lady named Minerva was always there to help and made my stay memorable. Special thanks to Dana Newman for her professionalism and prompt reply. There were so many great things to mention about this beautiful facility delicious breakfast, clean and huge rooms, exceptional service, great swimming pool and above all, a great team managing the hotel. Perfect 10 to this hotel. I was impressed with the size and cleanliness of the room. There was ample storage space, microwave, refrigerator, Keurig coffee machine, and safe. 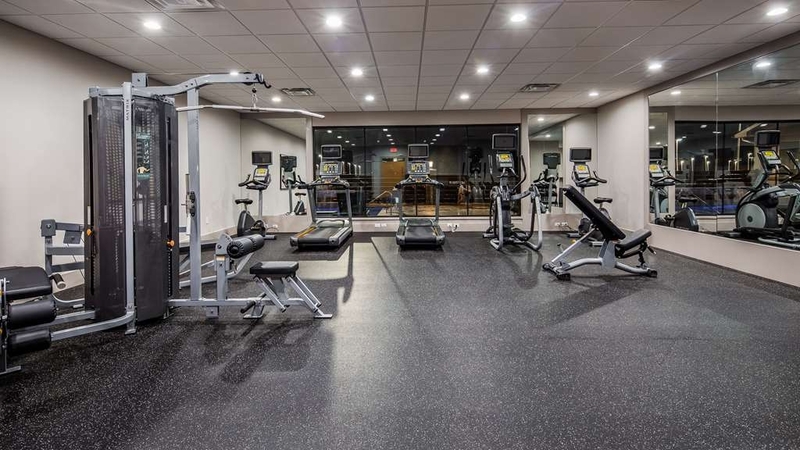 They also had a 24-hour gym but we did not use it and a pool/hot tub which we also did not use. We were only there a short time during the winter, so we did not use the pool. If we are back in this area again, I would certainly want to stay here again. Great location and easy to find off the I-10. The hotel is clean and professionally managed. The room was perfect for individual or family. Had the benefit of water, cookie and coffee as in-room amenities. Certainly will return whenever in the area around Houston. I would like to think you all for y'all hard work and wonderful attitude and for having the best Hotel I've stayed in we will be back I recommend everyone to stay at this hotel location best hotel ever again keep up the good work thank you! Best Western Premier is a great place to stay with nice sized rooms, very clean and a great staff. If you have not tried Best Western Premier you should, you will be very pleased. they offer a nice breakfast with a lot of choices. During the whole trip we could hear an excessive amount of noise from the hallway and from the rooms around us. For example, I could plainly hear the television playing in the next room. I'm suspicious that the rooms are not adequately sound-proofed. Aside from that I'd give this hotel a perfect score. The breakfast was better than expected (there is an omelet bar), and everything was impeccably clean. The beds were more mushy than I like, but I'm willing to call that a matter of personal preference. This is a fabulous hotel. Very reasonably priced. Very clean comfortable beds. Breakfast was very good. Everything you could want including omelets. All of the staff is helpful and friendly. You will enjoy . 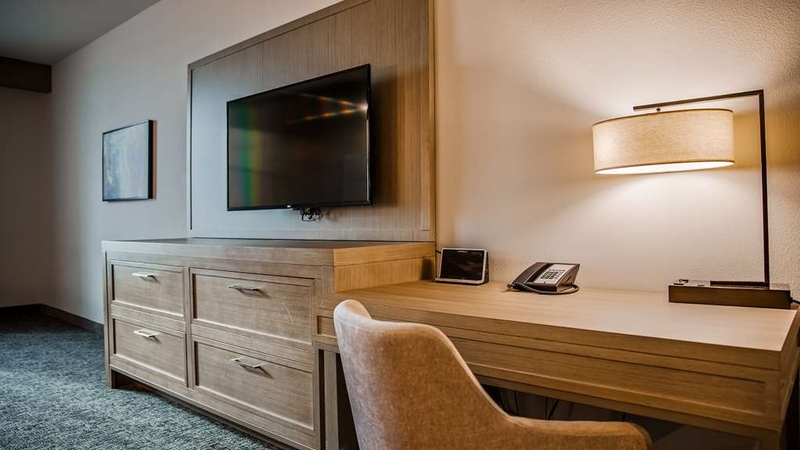 "Excellent hotel at Katy, Texas"
This hotel is very clean with a lot of space in the rooms, with great amenities, good breakfast with many options and services are excellent, computes and tv displays in the main lobby . The price is good. While I was only able to stay one night I found all the people I dealt with to be very friendly, cordial, and helpful. Specifically Minerva (Breakfast and Happy hour server), Zulma, Anthony (Chef, kitchen manager), Amber and Chandni at the desk. "Try It You'll Love It!" This is a beautiful hotel to stay in. I would prefer it better than the Marriots resort. 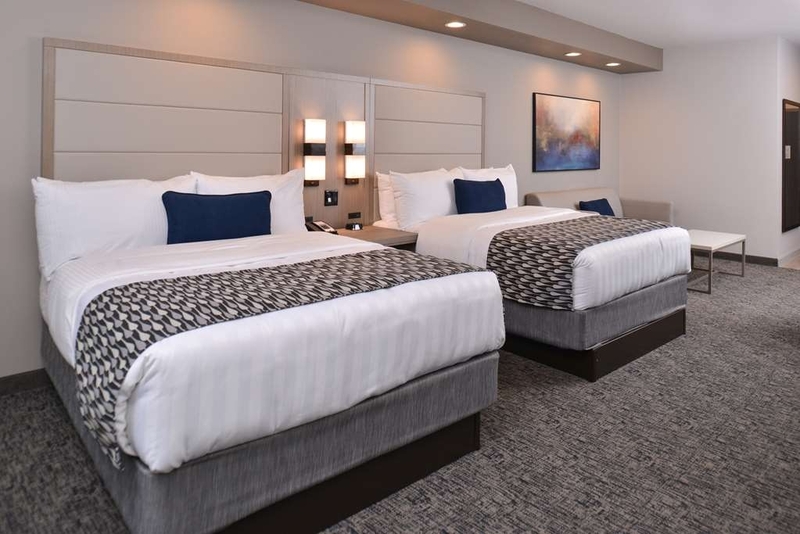 Spacious rooms and comfortable beds. Good overall experience! Can't wait until the next time I'm in Katy,Tx. I will definitely make sure that all of my friends and family try out this Hotel. I was Extremely impressed ! Our hotel experience was wonderful. We were surprised at how nice a facility this was for the price. We would recommend this hotel to anyone in the future. It works well for large families like ours. Good job Best Western!!! My husband and I were delighted with the hotel. We stayed there over Thanksgiving and the weekend. The hotel was immaculate. The modern decor was tasteful and restful. The bed was incredibly comfortable, hard to believe it was a hotel bed. I had a couple of requests and they were both fulfilled. (Shock!) The breakfast was incredible: omelets, waffles, oatmeal, etc and staff who bring you more juice. The entire hotel staff was friendly, helpful and patient. We both left saying we would look for more Best Western Premier Hotels when we travel. Chandni and Ali at the front desk made our stay memorable. Their hospitality and professionalism were second to none. The facility was strikingly clean and décor right on point. This will be our go-to hotel in the future! "Well Appointed Room Decor and Clean"
A hidden gem, where a family can bypass all the fake fluff that you have to Tip to receive. Instead, you get a lovely spacious family room with all the necessities, for a fabulous stay. I highly recommend staying here. You will Thank Me. The staff and facilities were very nice. The hotel is brand new, and all rooms were clean. The complimentary breakfast was a really great quality. They even have an omelet station. We didn't hit the bar, but I heard it was a good experience from family who stayed with us. "Great stay - highly recommended"
Brand new hotel with amenities you would expect at a higher rate. I would recommend this hotel to anyone traveling to Houston. If you are looking for a stay that will be comfortable, quiet and will provide a good value then this is the place to do it. Outstanding hotel!!! Stayed here for business and was very impressed with everything about it. Great location, easy access to restaurants and shopping. The staff is wonderful. Very friendly, very very nice and also very professional. I will stay here again as often as possible. 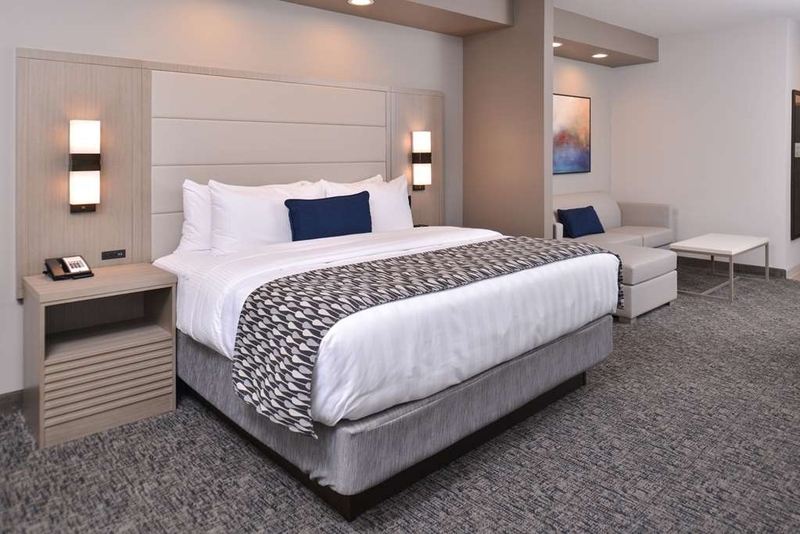 "This is now our "Go-TO" hotel in the Houston Area. We were also here in January, 2017"
Great breakfast team with Minerva and Anthony. Knowledgeable and professional owner/operator. The rooms are both comfortable and immaculate. This is a business-class hotel with blue-collar prices. A very good place. ""The Best Hotel, Amazing staff, and an Awesome Breakfast""
"Clean, great bed, friendly staff, great breakfast and nice bar." I didn't know a BW could be like this. I would choose this over a Westin any day. The room was spotless. Big screen HD TV. We were right over the lobby and it was still a quiet stay -- didn't hear another soul, and I heard that the hotel was full. Minerva and Alejandra were delightful. "Very nice hotel and nice breakfast "
Great service, Minerva and Anthony go above and beyond. Rooms were better than typical BW. Very clean and good bathroom product (i.e. good shampoo, toothpaste provided automatically). Was expecting a little more from interior design, our room was cramped on one end (couch, settee, and desk together on one end) while the other end was empty. TV wasn't centered, looked a little awkward but I'm picky that way. "Great! 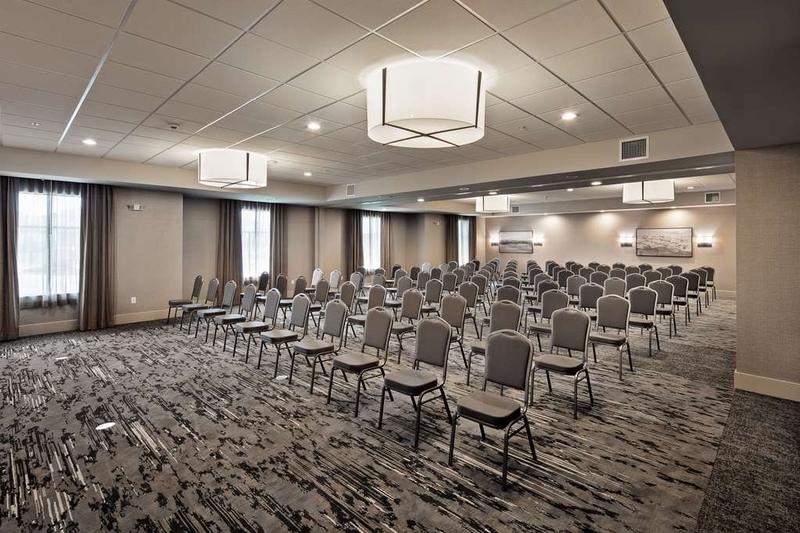 Overall expirience at the Best Western Premier Energy Corridor was exellent." From the great staff, cleanliness and professionalism. To the rooms and service. Will def advice clients and business partners to stay at Best Westerns. Even the clients at every Best Western Ive ever stayed have been great and friendly. "Wonderful Hotel! Super New, Super Nice!" Beautiful property and awesome staff! They helped us out as we were in a bind and needed a room. The previous hotel we had reserved was disappointing and the rooms were not clean. We called BW and they checked us in a 1am and we got the last room. We were beyond pleased. The hotel was very nice. All of the staff were very friendly. I was there on business and chose to stay at this location after finding out i could saved 30 minutes in my daily commute. The rooms were very nice. Breakfast was included and pretty good for a buffet style. Hotel experience was great for our family of 5! Would definitely recommend this hotel to others and would definitely stay here again! Service was excellent and staff was very friendly and helpful during our stay. "Greatest BW experience ever and they all were good!!" I just wrote s lengthy review for Premier BW on the BW survey. So this one will be brief. It is an amazingly comfortable, clean, beautiful hotel. All the BW's I have stayed at have the most comfortable beds and pillows !! They also have good continental breakfasts, but Premier BW has an unbelievably exceptional one, with a very large variety to choose from. Even an omelet bar. It also has a bar off of the lobby area. The prices were great as well. Will definitely stay there again. My husband and I stayed in this hotel yesterday while visiting the area. I have to say that this was one of the nicest groups of people I have ever encountered while traveling. The staff was so welcoming and helpful every time we went anywhere. Minerva made our dinner in the kitchen which was wonderful. Ale helped us at the front desk make some arrangements. Both of them were so kind and customer friendly.Elizabeth was our housekeeper and our room was immaculate. We really did love this hotel and will stay there again. What an excellent place to stay, awesome breakfast Lou does an awesome job on the eggs (personal favorite) as well as the cleanliness provide by Minewa and Anthony. Dana expresses great attitude and address every problem with a smile, as well as Alexandria, she has a very pleasant vibe. I can not for get my buddy Eduardo whom is very knowledgeable in his craft, every obstacle that arose in my room, was addressed with a magnitude of experience. Of course it must stem from the owner Raju this is an example of great boss great employees!!! "THE BEST HOTEL AND SERVICE I HAVE HAD"
All of the people there were very friendly and helpful. My co workers and I were very thankful for all Nora did for us. Made sure we had breakfast bags before leaving out for work at 4 this morning. She was amazing amd deff will be back. Thank you Nora for going out of your way everyday to make our stay the best one ever you are greatly appreciated!!! Our team has been staying at this hotel for the last 6-8 months and we always get awesome service. The beds and rooms are great. Location is perfect The staff will treat you like family and go over and beyond to make sure you're taken care of. Parking lot has good lighting and they have Security at night. I was greeted by a pleasant young lady that talked about what the restaurant/bar had to offer. The front desk ladies were pleasant and kind. The king room was BIG. Lots of space. Clean. Well stocked with soap shampoo qtips coffee, etc. refrigerator and coffee (individual cup) machine, large walk in shower. Hot water! Dark curtains. Absolutely beautiful. Very clean hotel. Breakfast buffet was great, a lot of variety, even an omelet bar. Staff was friendly and courteous. Room was spacious and clean. Wife accidentally left an item and when we called staff went straight to our room and found the staff had found the item and turned in to housekeeping. This hotel was gorgeous, clean, convenient to restaurants and shopping. Loved the staffs friendliness and attentiveness to guest! I would definitely stay at this hotel again. The pool and hot tub were clean and inviting. This was one of the best hotel experiences of my life. Absolutely wonderful staff and room. Lobby and amenities were wonderful. When I first walked in the room I was stunned. The room was one of the most comfortable and relaxing I've ever been in. Very nicely appointed, clean and professional staffed hotel with a great breakfast. Sharon did a great job checking us in. The location is great, it's just off the freeway in a nice neighborhood with a lot of parking! I am a guest at the BWP Energy corridor katy tx Nora at guest services was amazing. she welcomed my husband, my son and I as we walked through the door, when we arrived to our room I noticed I for got our tooth brushes and body was at home. I went to the front desk and she gave me a complementary bag of all the right necessities. we've been to multiple hotel since hurricane Harvey and this is the first place that hasn't made us pay for the natural necessities need to just get by, I the reason I am writing this is because I didn't even remember the deodorant or conditioner needed to wash my daughters hair but she did, and that to me is amazing hosting and caring #Houston strong. BWP thank you for hiring such an amazing person. The hotel is upper level 4 star. The staff are quality people. Specific staff members that deserve A+ are Minerva, Amber and Alejandra. The rooms are comfortable, good TV, maintained. 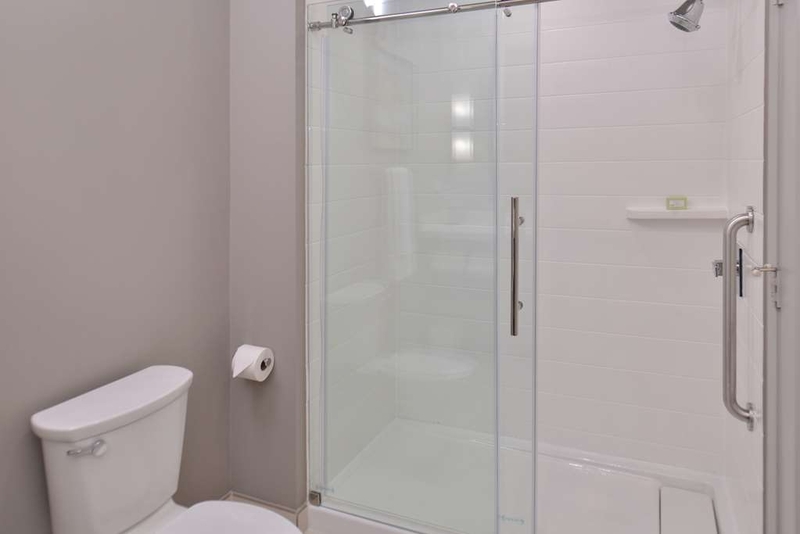 Good showers in bathroom. We stayed at this Hotel for the 1st time. It is brand new hotel, excptional great service from start to end of our stay. The Frontdesk Lady who wrked on 21st Sep 2017 evening shift was helpfull to us in locating the good resturants in the area. She was very helpful & knowledgeable . We were happy that we picked this hotel for our stay. "Excellent service, feel like Home..."
I stayed here for 8 days after Hurricane Harvey, in the area for business. The staff were attentive and professional, and especially friendly and personable. Thank you to Amber and Sharon, for all your assistance. The beds were some of the best that I've encountered in any hotel. My team conducted a large meeting at this location. The hotel staff, made that process an easy one. They setup a large projector, and provided refreshments. Lastly the breakfast at this hotel is top notch! The chef each morning makes superb omelets! Say hi to him when you're there! Was a great stay. Very nice people, Jared, Amber, Minerva, and Alexandra were so friendly and helpful. They went above and beyond to make sure I was comfortable and happy. The food was excellent. When I came back from work it was always clean. We stayed here during voluntary evacuation from Hurricane Harvey and were very pleasantly surprised. The room was huge and very clean. The staff was super friendly and helpful. Would definitely recommend; great location and breakfast was a nice bonus. Being a hurricane Harvey evacuee I was extremely thankful for how my family was made to feel at home by the entire staff. They were courteous and extremely thoughtful of the situation we were in. The manager Dana Newman was always concern and ask how she could help when we came back to the hotel after working on our house, which after a long day of removing drywall made us feel special. Best Western should be extremely thankful and proud to have employee of this magnitude working for their company. Hotel is clean and breakfast is good. We showed up the morning after the hurricane and everyone was so nice and accommodating. Alejandra, Amber, and Raju really know and understand customer service. Fantastic hotel! "Review of Best Western Premier Hotel, Energy Corridor, Katy, Texas"
Fantastic hotel will definitely stay here again. Very clean and comfortable. Nothing is too much trouble for the staff who looked after our party of 12 very well. Special thanks to Minerva, Amber, Anthony, Lou, Alejandra, Jolynn, Alexis Dana, and Sharon. They helped to make our stay memorable and were made to feel like part of one big happy family. Amazing! Clean, comfortable, and courteous service. Comparable or exceeds hotels charging twice the price. Rooms are LARGE, linens are high quality, the beds very comfortable and provided bath products very nice. Less than a year old and still like new. Very fresh rooms that are spotlessly clean with huge bed and living area. In the center of a great area and very close to shops and restaurants. Excellent and the most friendly customer service. Recommend. I went to spend the night because my A/C was broke and I decided to get a room at this hotel, beds are so comfortable super clean and nice staff, breakfast was ready at 6 am sharp but I guess they need more items to be called a real buffet. But overall its a excellent hotel. Gabrielle was friendly and very helpful at the Best Western Premier in Katy,TX. It is always a pleasure staying with Best Western. They have become my preferred accommodation provider in my travels around the USA. Great staff, (Amber was great)-great breakfast, ( Minerva was great) great rooms, everything about this hotel is perfect, no complains at all!! 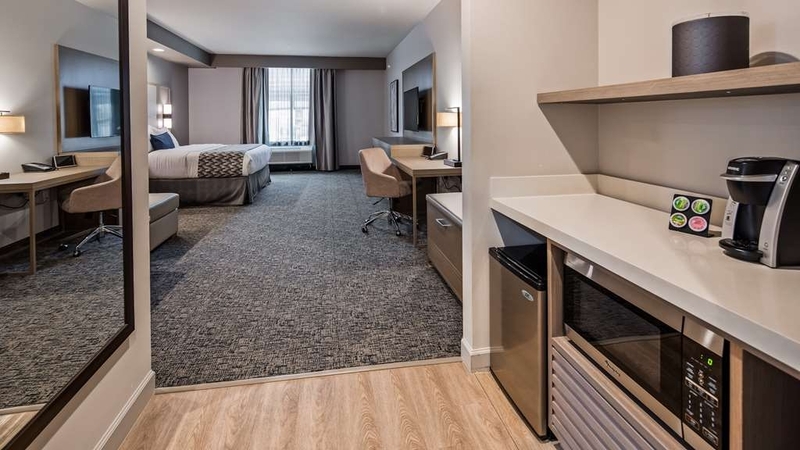 I can't find anything run about this hotel, lastly it's a short drive to downtown Houston (25-30 minutes).. Keep up the good work, definetly will be back. 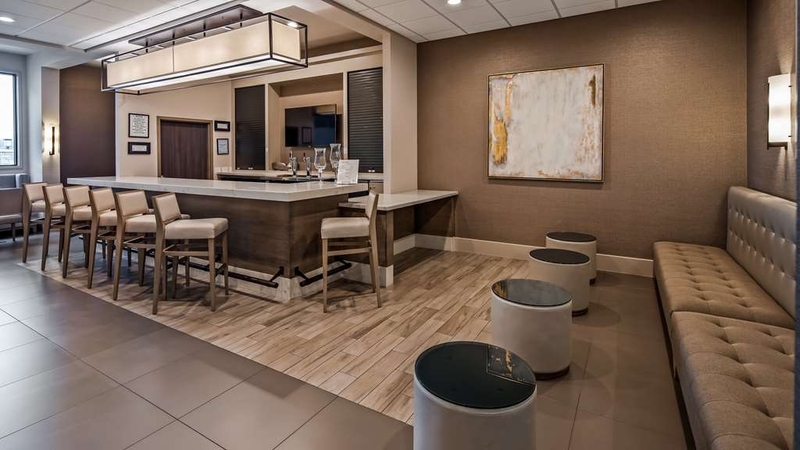 Really nice newer place, very easy access to I-10, super staff and the room design and layout is great, comfortable beds, nice bathrooms, light switches by bed let you control lights in room. 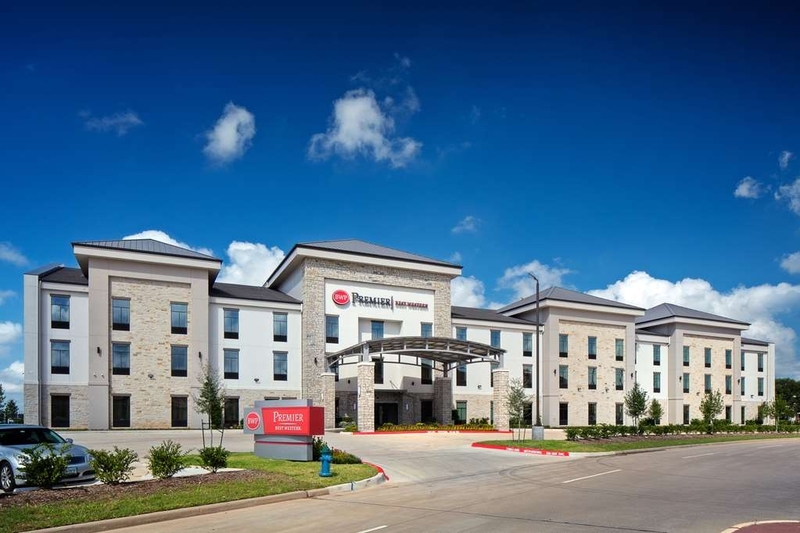 Really great staff, If you are working or driving around Katy,Tx or I-10 corridor stay here. "Family and business in one"
Everything was perfect and the staff was great. Always friendly and always helpful. I needed lots of help from desk clerk Gabrielle one night, and she was very accommodating. Our housekeeper, Minerva, was very helpful and provided everything we needed. The breakfast guys, Lou and Anthony were great, very nice, helpful, and treated my family great. Super friendly. Always asked if they could get me anything. Sharon, the morning front desk clerk, was also very helpful nice and flexible. Communicated well with us, and always asked if we needed anything before we left for the day. 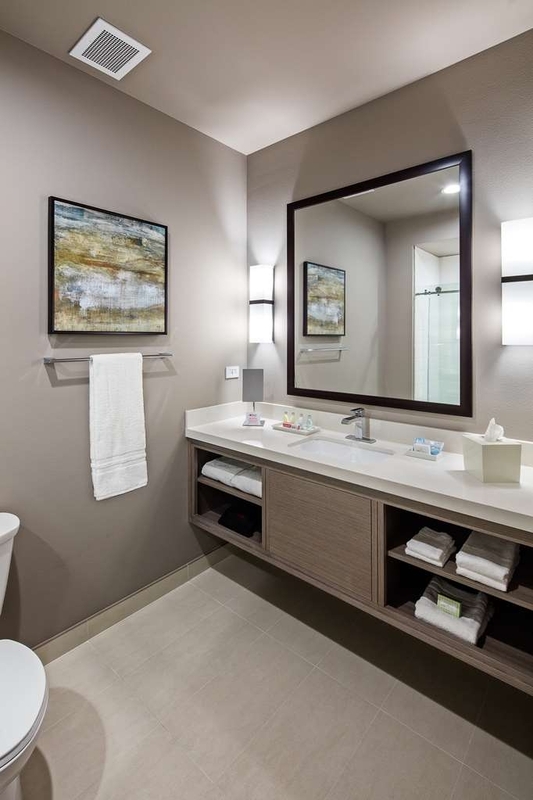 "Very fresh and new hotel"
This hotel gives you a quiet and pleasant stay when in Katy. The distance to Houston and other facilities is no problem. Meals and staff are very good and the rooms gives you a good feeling when you enter. The king suite was beyond expectations and was one of the most comfortable hotels I've stayed in. I Highly recommend this hotel for family, personal, or business purposes. Thanks again to all of the staff! Gabrielle was very helpful when we checked in. My kids and I forgot a bag of our toiletries. She put a bag together and brought to our room. Was very informative of the local restaurants for us to go to. Was a very nice place ! "Best hotel in the area hand down!" This hotel is extremely clean and staff was great. Price was excellent for what you get. There are plenty of good restaurants around the area. It is also easy to get to the nearby hospitals via a back road instead of using the highway. Anyone staying in Katy or even looking to go to Houston I would pick this hotel over many many I have been to. The hotel was beautiful! Rooms are very spacious with eye pleasing decor. The breakfast was amazing! Andre Smith and Minerva were awesome! They made my family feel like so welcomed. It was so refreshing to be at a place that made customer service a priority. Room was amazing and spacious, and friend desk was very helpful if i needed anything extra, the woman who checked us in, Amber, was very nice and polite and made us feel welcome. When visiting the katy area will be sure to stay there again! The hotel was very clean and spacious. The Staff was very kind and helpful, always greeting guest with a smile. Breakfast was delicious I love The Omelette station. I really enjoyed my stay. I will definitely stay here again! Love, Love, Love this hotel! Very new with contemporary design & colors. Great location on the West side of Houston. Wonderful breakfast area also offering made-to-order omelettes by Andre. Other staff/employees, like Miss Minerva, were so friendly & helpful. Clean, clean, clean facility! Rooms were amazing & large & spacious! 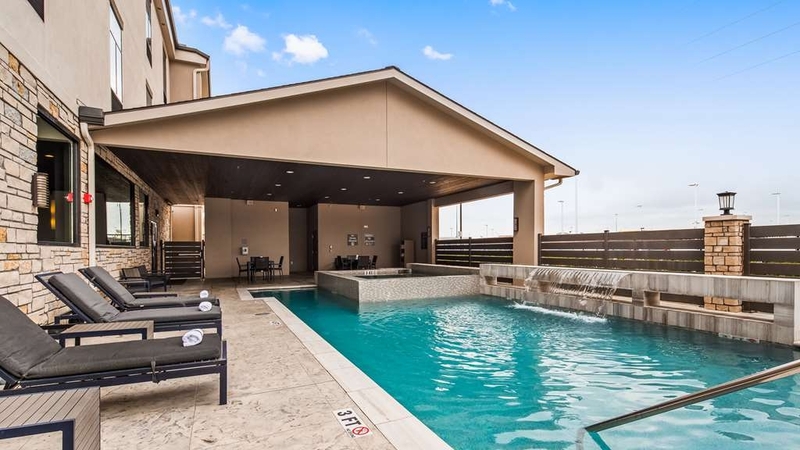 Location is near lots of restaurants & shopping & just a short distance from Katy Mills Mall. The Hotel was clean, comfortable and the service was great. The staff went beyond their duties to get information for me. It was easily accessible from the interstate. Many restaurants near by, some in walking distance if it wasn't so hot in Texas. Its defenetly the best option to stay when visiting, Katy, Tx. Great location surrounded by plenty of restaurants. The staff is Great. 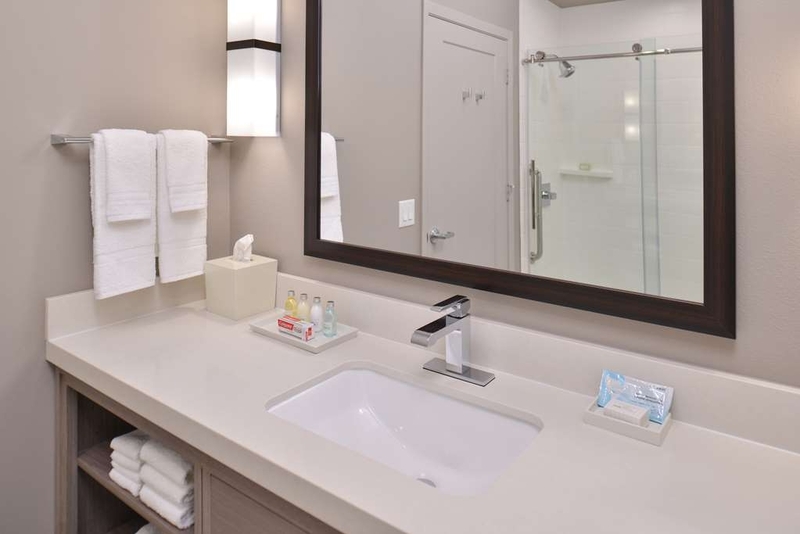 Super Clean, and the hotel is fully equiped with very high quality. I really enjoyed my stay. The hotel was absolutely amazing from the front entrance of the lobby to the elevator the hallways all were luminated with beautiful lights. The housekeeping staff when greeting were very professional asking to make sure that you were accommodated with enough towels. The breakfast was very scrumptious and delicious. The swimming pool and jacuzzi absolutely amazing! I would recommend this hotel to everyone I love it enjoyed my stay I'll be back! This hotel exceeded our expectations from the space of the room to their complimentary breakfast. I will definitely stay here again. To bad they don't have a Best Western Premier in the San Antonio or Austin area. "not the old Best Western!" I never give 10s to anyone, this place is exceptional! From the moment we checked in to the moment we said our goodbyes! this hotel is locaL to many restaurants. Pool is great! Enjoy your stay as the staff will do their utmost to make it a wonderful experience. "Excellent hotel. Great front desk agent in Amber." Great stay. Amber shines. We stayed for my daughters hospital visit. The pool was nice, hot tub needed more water for the Jets to work better. Understandable because of evaporation. The hotel was so clean. From the greeting on entering until our departure four days later, our time here was nothing short of amazing. Our room was very spacious, clean, and comfortable. The breakfast was "hotel" style but with addition of made-to-order omelettes - which the gentleman cooking actually brought to us at our table! That action was indicative of the service we experienced in every part of the hotel. We totally enjoyed our stay. 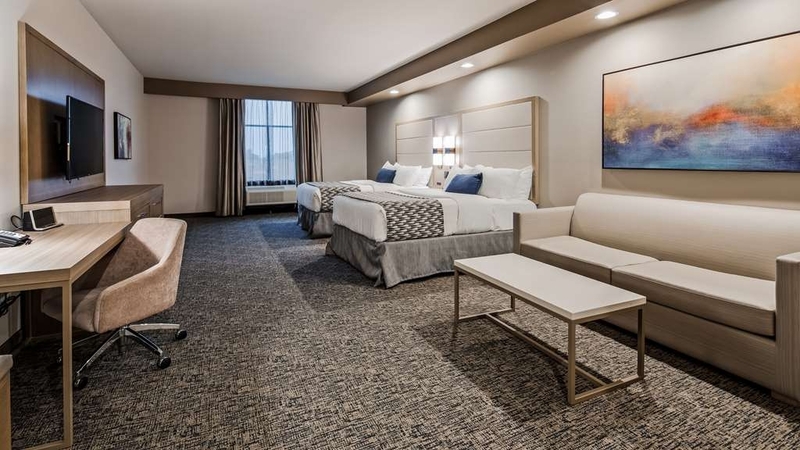 I enjoyed my stay overall in this hotel, it was clean, spacious, helpful employees (Amber was Great), beds were comfy and did I say clean:-) I would recommend and I would certainly stay again! I didn't give an Excellent rating, because I feel breakfast needs to improve, not with taste, but with quantity, if your not there at the start of breakfast you will miss out, and I feel that breakfast should be replenished if it is still within the Breakfast hours. "Great affordable hotel in Katy, TX"
I love this place! I have stayed at two other hotels in Katy and this one is by far the best in service, amenities, and room accommodations. Their staff were terrific! I had a great time talking and laughing with them. They are ever helpful and caring, always asking if we need anything. Very friendly! I cannot say enough about how perfect this hotel experience is. I will stay there when I visit Houston from here on out. 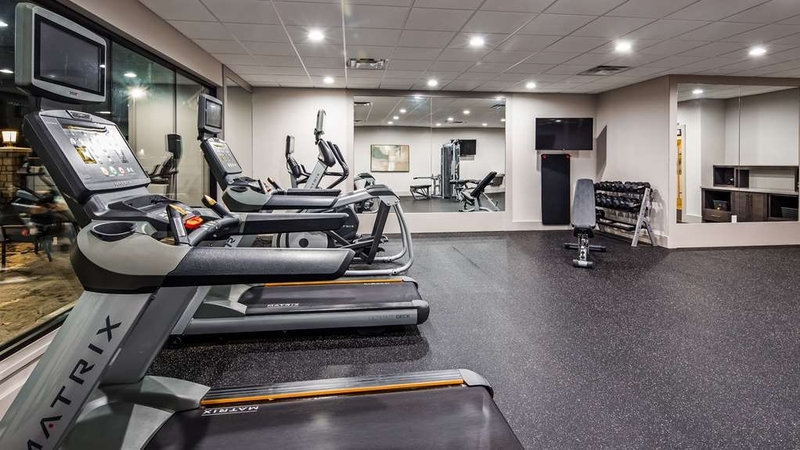 The bed was magnificent, the fitness center had more than enough room and great equipment. The carpet was cushioned and the bath room was beautiful! Will stay again. There are a lot of hotels I could pick to stay at in this area, but this Best Western surely can't be beat. I can't even wait to check out tomorrow to complete this review. How the front desk staff managed to memorize my name on sight with a lot of other guests staying there is beyond me. The room was spacious and clean. The bathroom was clean. The pool and gym facilities were clean. There's a nice sundries shop in the lobby. The location is close to dozens of restaurants, shops, and malls. Zero complaints. Keep up the amazing work, BW ladies and gentlemen, it's greatly appreciated from us long-time road warriors! Excellent visit in particular Andre Smith who was very accommodating. 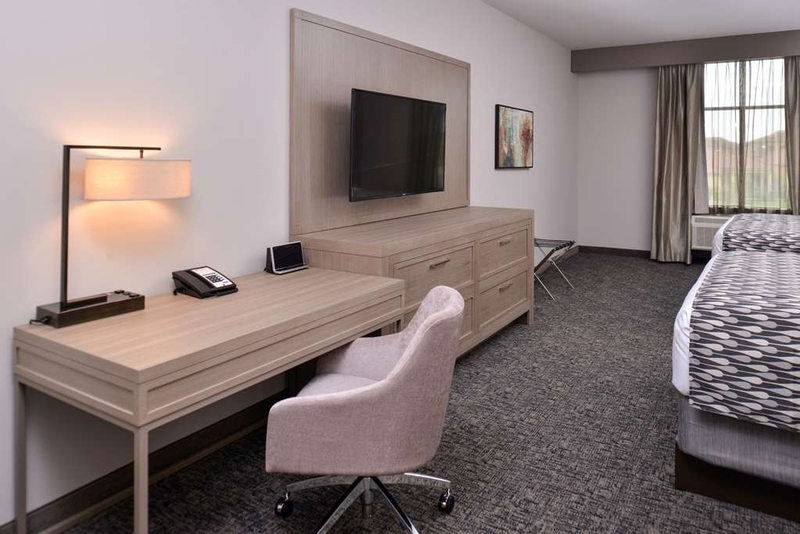 The rooms are very spacious and take into account things such as plenty of multiple charging outlets. The breakfast was fantastic a vast selection. "Best Hotel in Years! We are Diamond Elite members and this one is the best ever." I cannot say enough about how excellent this hotel was. Jordan at the front desk is so genuinely warm and helpful. Josh was another staffer who was so kind and helpful. He grew up in the area and gave tons of great advice on appreciating Katy and the surrounding areas. Our room was gigantic! It was 3/4 of a basketball court and everything was brand new! The gym was great, the corridors were clean. There was plenty of lounging and work space on the ground floor, you never felt like you were crowding in with other guests. There were cookies available day and night for free and a well-stocked snack bar you can buy stuff from if you get the munchies. Each day our breakfast was prepared to order and perfection by Josh and Anthony. This has to be the best Best Western on the planet and it is far better than many 5-star hotels. I usually stay in the Galleria however this time the majority of my meetings were in the Energy Corridor area. I was extremely impressed with how clean, spacious and quiet the rooms were. Top notch! Will stay here again. Out of all the Best Western facilities I have visited, this would not be my number 1 choice. Staff and facility were all very pleasant. Rooms were extremely large as what I have experienced. Complimentary breakfast was an A+, not just cereal, fruit or minimal but a real hot breakfast. Excellent service and excellent staff. We could not have picked a more comfortable and beautiful place to stay during the week of our daughter's wedding in Houston. The staff was kind, courteous, and very supportive of our needs in preparation to this big day. 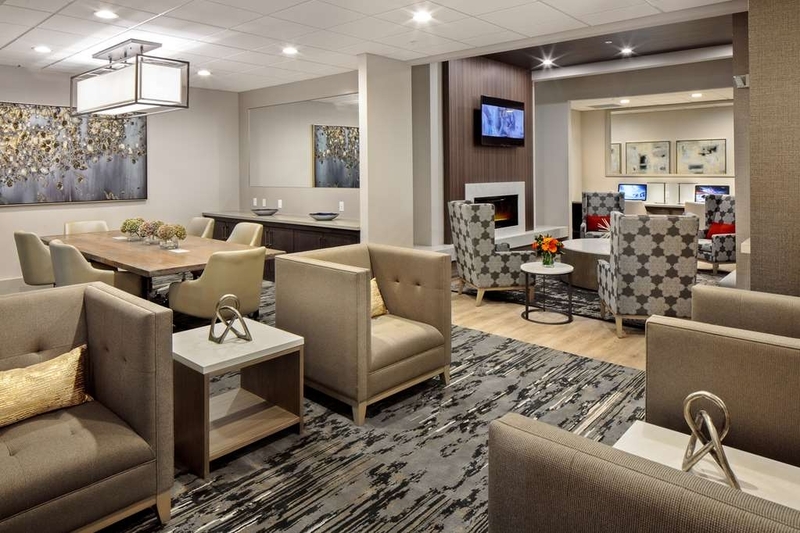 Staying at Best Western Energy Corridor made our week all the more happier. Thank you. This is an amazing hotel. The rooms were great and the beds comfy. 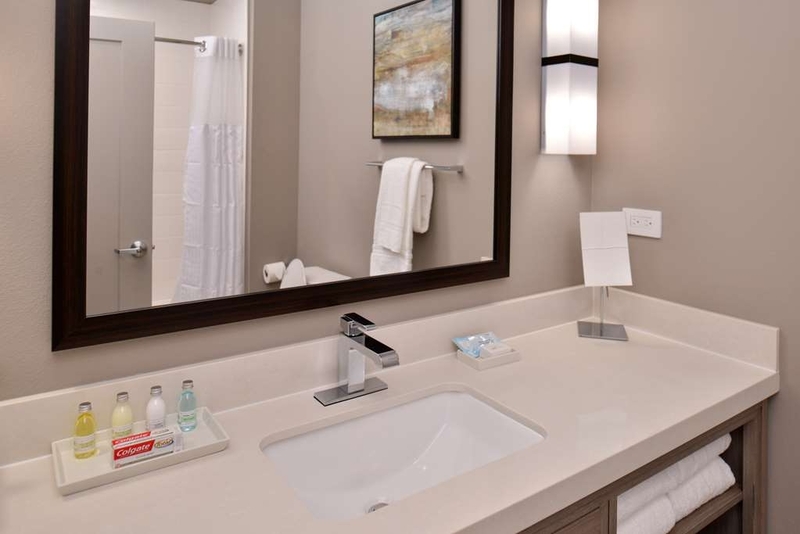 The whole appearance of the hotel was fantastic and everything was very clean and cared for. We didn't get to have breakfast as we got up to late but the breakfast area is very big. Everyone here was also very helpful and friendly. Will definitely look for the premier hotels from now on. The hotel looked so new and nice! The bed was amazing, the breakfast was awesome, would definitely stay here again! The pool was also very nice! The only thing I would complain about is the hotel has a bar that at 10PM was not operating. But that's it! 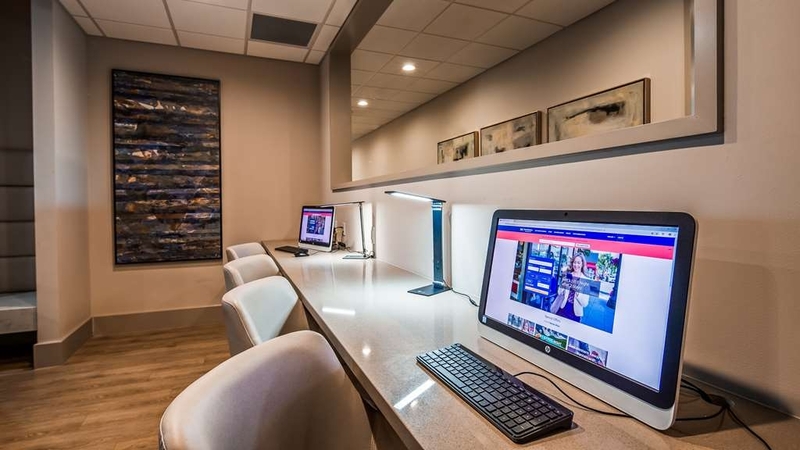 "I enjoyed my Friday night stay at the Best Western Energy Corridor!" This property is lovely! Spacious rooms, a large lobby, and an even better spa/pool outside! The check in process was a breeze even though i arrived fairly late around 11pm. I did not get to try the breakfast but the cafe area set up was organized and extremely clean. I will definitely be coming back soon! Very clean hotel, excellent staff. This is a great place to stay. Location was good for us. I will definitely stay here again if I am in Houston. The breakfast is legit. Probably one of the best breakfasts I have had at a hotel that offers one. 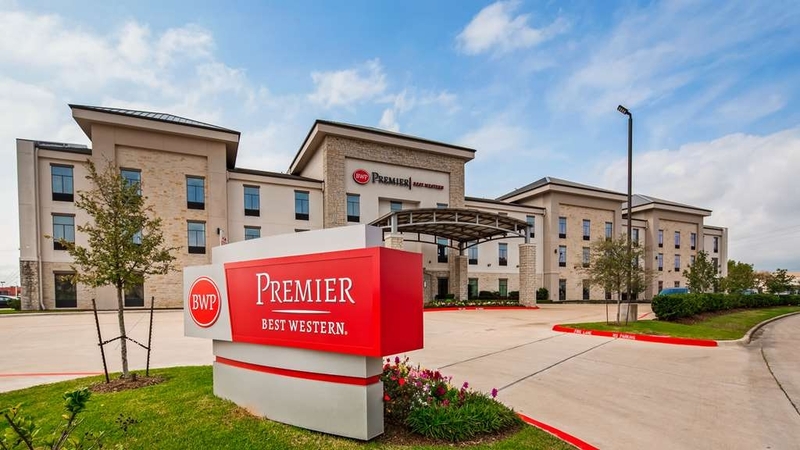 "Best Western Premier is the best hotel in Katy, TX"
My family and I stayed at the Best Western Premier in Katy, TX on 6/3/17. We were in town visiting my boyfriend's parents which live about 10 minutes south of the hotel. 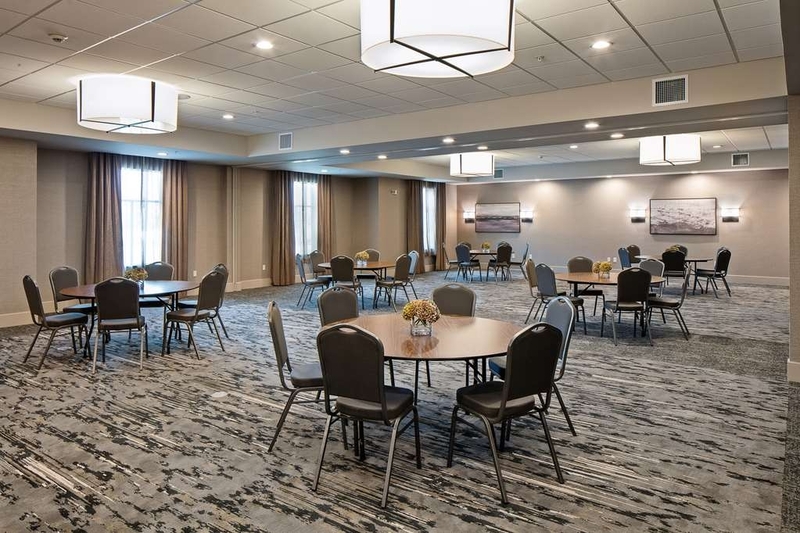 We thoroughly enjoyed the modern decor and cleanliness of the rooms and the awesome breakfast (eggs, bacon, sausage, hash browns, coffee, cereal, pastries, etc.). It is kind of early (6:30-9:30) but worth it. The front desk attendants were nice and helpful as well. Free coffee was available at all times in the lobby. 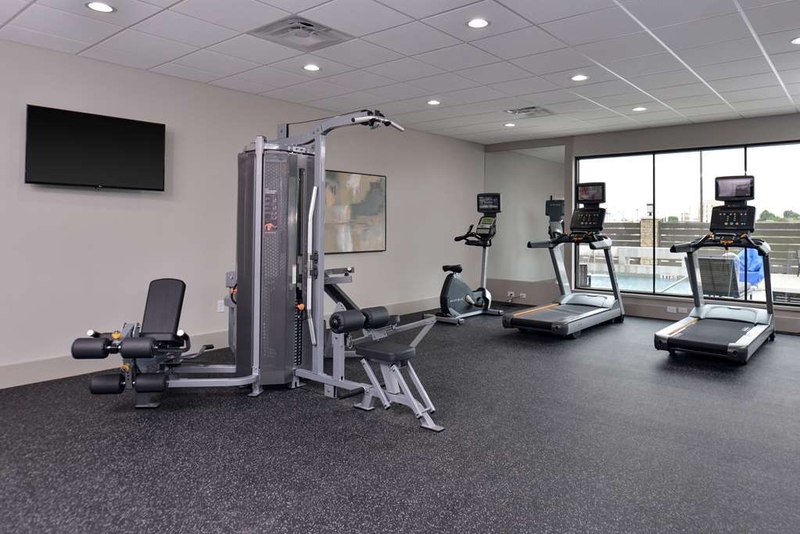 Other amenities included the fitness center, pool, and business center. The one elevator is the only thing that makes this hotel feel like its small (there are only 3 floors but 2 elevators would be nice). One thing that annoyed me at night was this clicking sound, similar to someone turning a light switch on and off, about every 30 seconds. I think it's something to do with the electric wiring in the walls but for someone who needs all the right sleeping conditions to sleep, this was annoying as heck. I eventually put some toilet paper in my ears and fell asleep within 5 minutes. The showers were amazing, great water pressure and temperature. Didn't want to get out! Overall, great stay and would definitely stay here again while visiting Katy. We had two rooms (1 king and 1 double) for $125 on Expedia and $101 on Hotwire. I think that these were reasonably priced for the what you get. Our family of 4, including 2 boys age 11 and 13 spent one night here for a family graduation. We had a room with two queen beds and a couch. There was plenty of room and one of the boys chose to sleep on the couch. We enjoyed the space, wifi for Netflix, gym and complimentary breakfast. Would recommend and would come back. Excellent location. Front staff went out of her way to make sure we were satisfied with our room. Breakfast was good. I do wish the A.C would get colder at night, otherwise no complaints. I would recommend staying at this location. i would very much recommend this hotel. The staff was very nice and helpful especially Josh at the bar. The pool and hot tub was awesome too. We will be back. This will be our hotel of choice going forward. The hotel is clean, staff are friendly and they actually serve a real breakfast. Beautiful rooms. Wish I was staying longer. Next time I am in Houston, I already know that I will be staying here. Might even bring the wife, if she stops talking!!! Stayed here four times for business. This beautiful hotel is spotless. Staff is friendly and there's a security guard patrolling the parking lot at night. We felt very safe here. There's complimentary HBO and Cinemax. There's free cookies in the evening. Rooms have a refrigerator and microwave which we used. The breakfast is fabulous with an omelette station, plus many other options. We did not use the pool or fitness center but they looked clean. The only negative, which is very minor, is I'd like half-n-half for my coffee instead of artificial creamers. Overall a great place to stay and we'll be back! We were very satusfied with our stay at this hotel! Definitely will be back if we are ever in town again. The check in desk was friendly and available, we've been to a few hotels where he front desk staff is chatting with friends or just not present at all. The beds are SO COMFORTABLE! The bathroom is clean and well set up. Our room didn't have a tub but we weren't travelling with kids so it was a non-issue. The shower was pretty amazing. Clean, comfortable, convenient and well priced. We had hoped that the listed restaurant/bar was open every night, but it appears they may only be open on certain occasions, as they were closed the Friday night we stayed. Slightly disappointed, but hotel was excellent all around despite that. We were really impressed with the quality of the hotel and efficiency of the staff. On our next trip to the Houston area, we will definitely be booking this hotel. Great location. We were very happy with our selection. 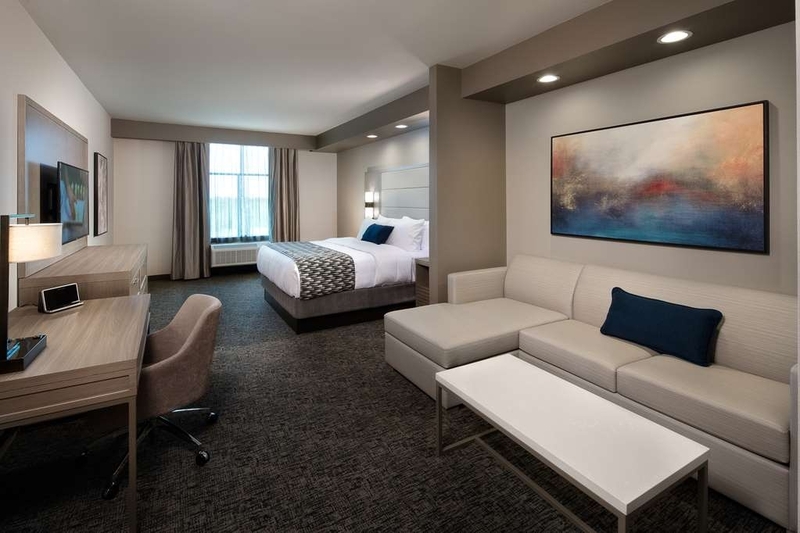 We recommend this hotel to anyone looking for an excellent room, with great customer service. The free breakfast was a huge bonus. Everyone was just so friendly. Thanks! First time in a premier property and was very impressed. Very roomy, clean and well located. WiFi was strong and all amenities were of excellent quality. Square footage of room was more than adequate. 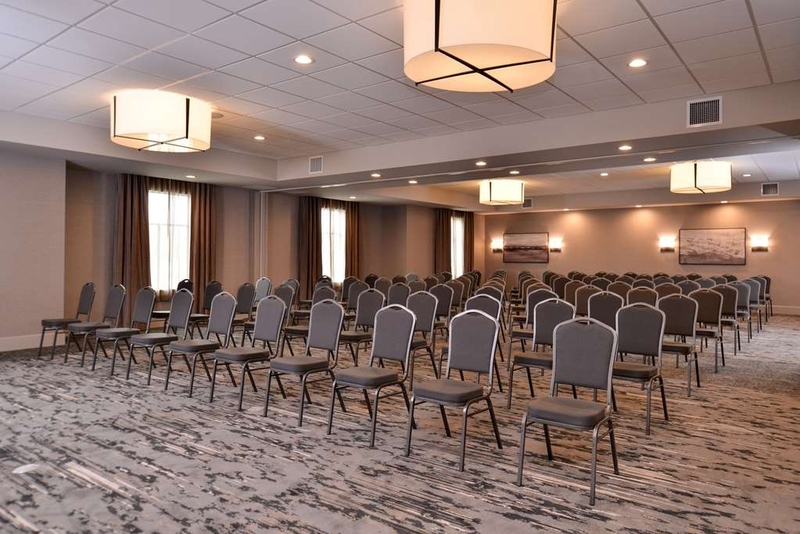 "You will love this hotel"
This hotel is well located and the room is very spacious, overall very clean and neat, easy parking for the guests. Staff are friendly and helpful. Huge are and selection for your morning breakfast. Love it! Location was great. Hotel was fantastic. Went for competition downtown Houston. 20 mins from hotel to downtown pending traffic; as Google will tell ya. Just got to watch out for the crazy drivers! A few restaurants within walking distance if you don't want to get back out. Did not try the hotel restaurant as it was a bday dinner & bday girl got her pick of place. Very nice hotel for the price. Very clean and brand new. Very cute out and helpful front desk personnel. I would definitely return to this establishment. The rooms are quite large and very clean as well. "Finally, an Asian Style Hotel"
My wife and I stayed for one night, room 317. Large room with two wonderfully comfortable queen sized beds, sitting area with comfortable sofa and coffee table. This hotel was reminiscent of one of the many Asian style hotels in which we have stayed. 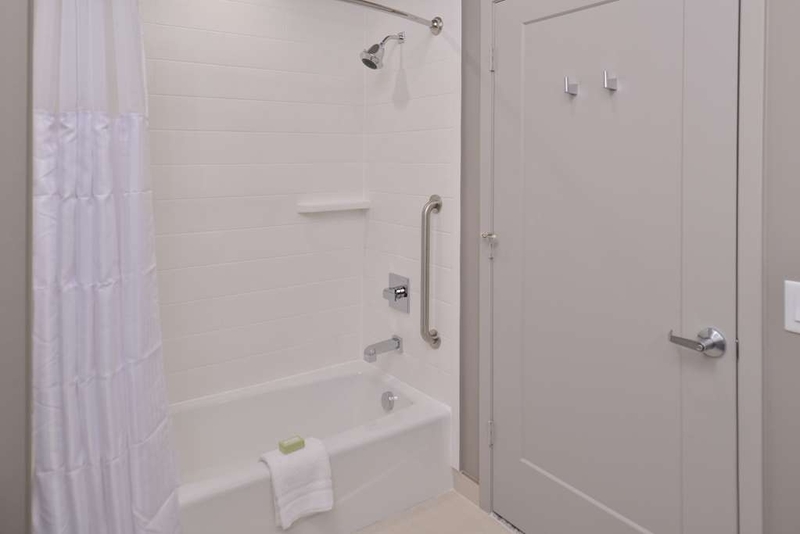 Large rooms, spacious, minimalist in design (very relaxing), microwave, fridge, state of the art coffee maker, large bathroom and shower, excellent toiletries, enough towels with the option to stay green (one towel every two days which my wife and I do in some cases), and the breakfast was great. Fresh omelettes and waffles, cereal, nice selection of breakfast meats (not too greasy), pastries and muffins, cereal, fresh coffee (regular, medium and strong). The experience was awesome!! Keep up the good work BWPEC. While it might mean going the extra mile to keep this level of comfort and service so high, as your competitors slack off after a good run at the beginning, your customers will BE BACK if you keep up the above par standards. BTW, Jordan and Sharon were top notch!! Only stayed one night and wish we had more time. This place is fantastic. Huge rooms and the best free breakfast I've ever had while traveling. Rates are great as well. Bathroom was well laid out and the beds very comfortable. Pool looked gorgeous but we didn't get a chance to use it. Plenty of parking and walking distance from a bunch of places to eat. Overall stay was great. The rooms were clean and comfortable. The staff was very friendly and courteous. The coffee was great! Typically I do not care for hotel coffee - it was probably the best hotel coffee I've had this side of Europe. It's more than my expectation experience staying in the this hotel, moreover each day I spend here had difference experience during the breakfast,it's was not good enough but I laid a little complain to the services desk about it and it's change the following day breakfast . The hotel was clean and brand new. The rooms were clean and accommodated everyone without being overcrowded. I would highly recommend this hotel to others. We plan on staying here again in the near future. We stayed here on a previous strip and just had to return! The beds are so comfortable, the rooms are very clean. The breakfast is special in that they make Omelettes to order! The staff are all very cordial and helpful! "This hotel is an awesome place to stay!" This hotel is beautiful, clean, and a great place to stay! The breakfast has everything you can think of and is delicious. They even have someone there to make custom omelets for you. The pool is amazing with a waterfall and colored lights. You will have a good experience if you stay here! 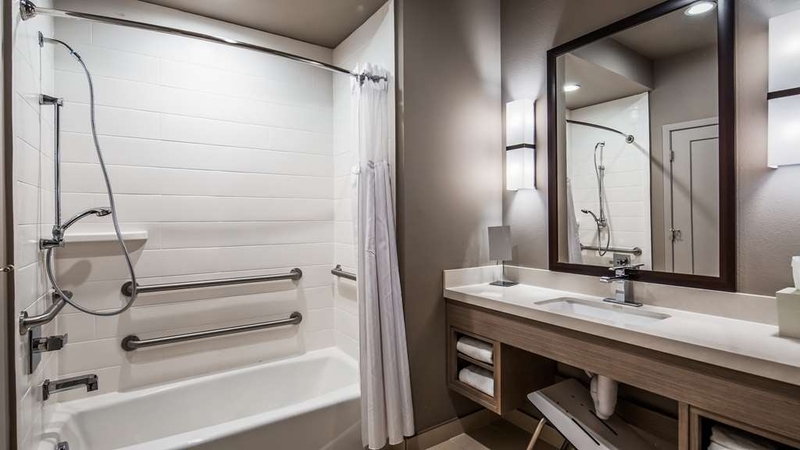 Clean, trendy, accessible - as someone who works at a hotel and knows the ins and outs of hospitality possibilities, I had no complaints at all! The staff was great - my grandparents just loved Sarah at the front desk; I felt like they were very well taken care of. Thank you!!! "Fantastic Stay, Best Western Premier Hotel a must." Even thought it was 3AM when we arrived, Sharron greeted us with a warm welcome. Rooms are XTRA LRG, comfortable, & CLEAN. Hot tub is biggest I have ever seen, clean & perfect. Breakfast has lots of options, anything you could want. Fitness center is awesome! 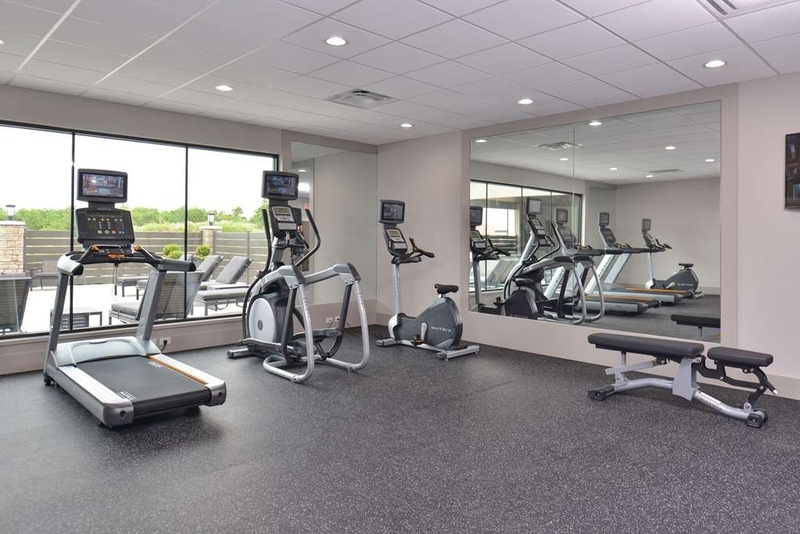 Tons of room to use treadmills, bikes, ellipticals, weights, or even jump rope. Never had to ask for anything because it was always right there for us. Staff is super friendly. "MUST STAY! New Best Western hotel...clean rooms&great breakfast 2 boot!!!" 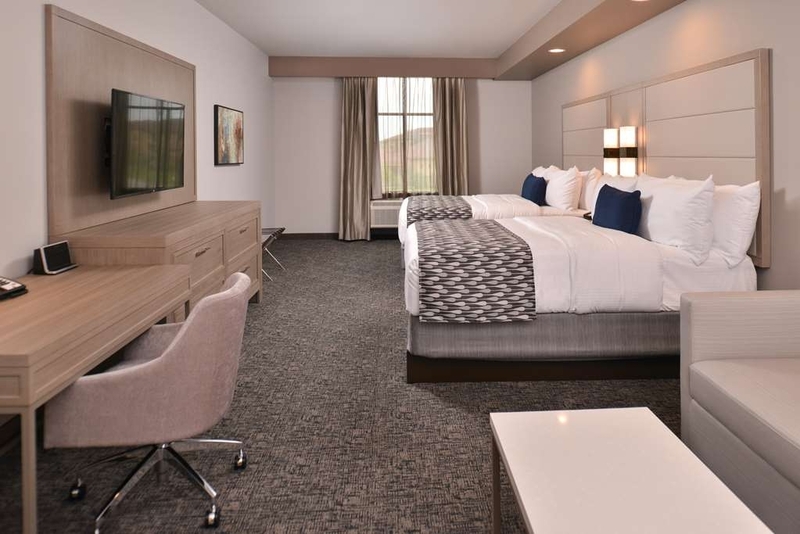 This Best Western Hotel is the NEW hotels that are rising up from the old Best Westerns chain. It is over the top clean, great location lots of restaurants, near freeway great breakfast and staff is over the TOP Awesome!!! The staff is very helpful friendly hospitable and customer service focus and the top attitudes 2 boot!!! Who ever hired & trained the staff did an awesome job! They each have great customer service skills! ""YOUR HOME AWAY FROM HOME""
This hotel has an excellent staff member name Sharon, goes out of the way of providing you information and services. 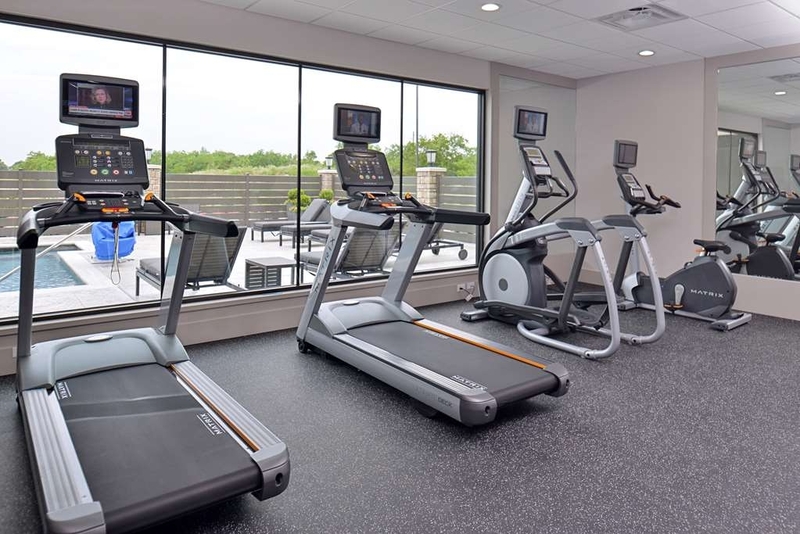 The hotel has a 24 hour fitness that make you just want to exercise every day. This hotel amenities are just outstanding. The location is perfect. Our Company will definitely be staying here in the future. "NOTEWORTHY COMFY BEDS!! Cool. Modern. Clean." This place opened about 3 months ago, so it was nice to walk in feeling and smelling everything new. I stayed in a 2 queen bedroom, which was a very big room with plenty of space. Loved how there was a kuerig, fridge and microwave (both of which were stainless steel). The fridge has both a freezer and fridge section which was a huge plus. Things I really loved: - REALLY comfy beds, fluffy king sized pillows, plush bed, and comforter. Did I mention how fluffy and comfy the beds were? I literally got lost in fluffy pillows. 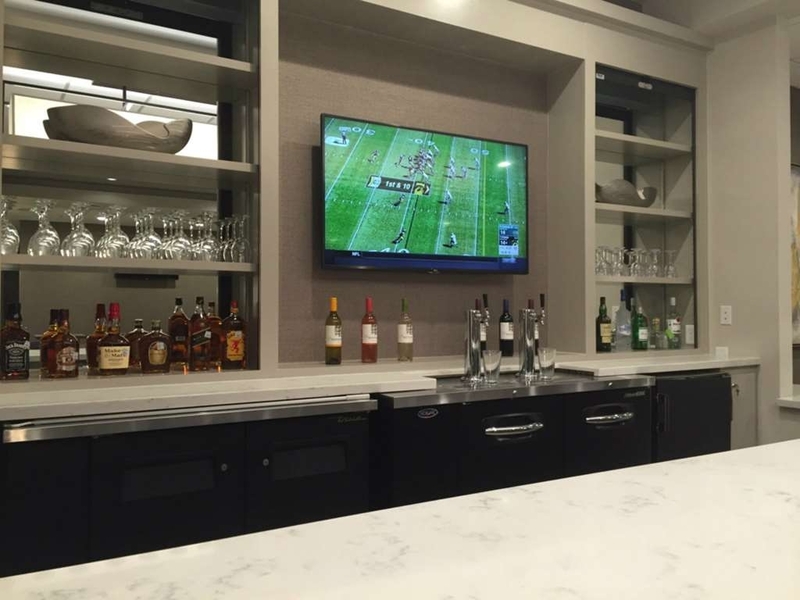 - large flat screen mounted to wall w direct tv channels. You can angle the tv towards the beds or couches. This is probably the nicest TV I've had in any hotel I've stayed at. 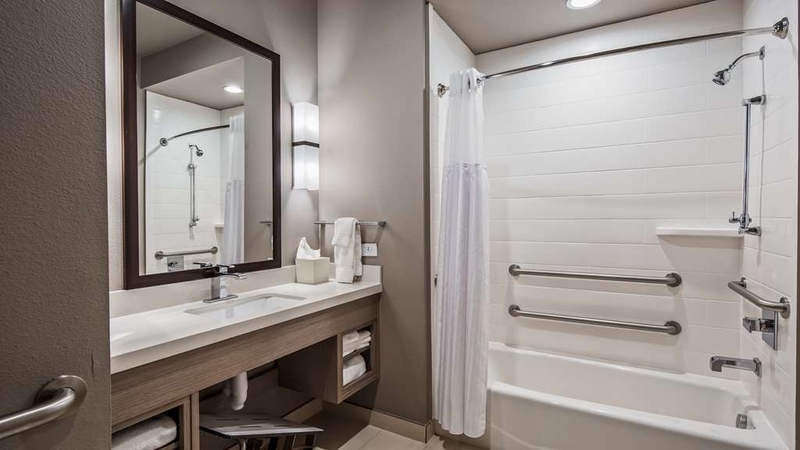 - brightly lit bathroom, especially in the shower - USB charging ports everywhere - safe is mounted into the wall, although it is a smaller safe w little depth - The gym is small but the equipment that's there is high end and clean. Fancy treadmill. Could add pull up bars. - Good amount of table space to do work General comments: - gym amenities (hand sanitizer dispenser and water) could be better stocked. There was no bottled water on 3/4 nights I stayed there, though there is a water fountain. - Manager is SUPER helpful and nice. Went out of her way to make sure I enjoyed my stay. MUCH APPRECIATED! - Decent hotel breakfast w variety (make your own waffles, oatmeal, eggs, bacon, potatoes, sausage, carbs, cereal, fruit).. Sarah was very nice and had a great attitude w ppl - great wifi speeds. However, I had to login at least 2x a day to reconnect the wifi. Could make it so logging in once keeps the wifi working. 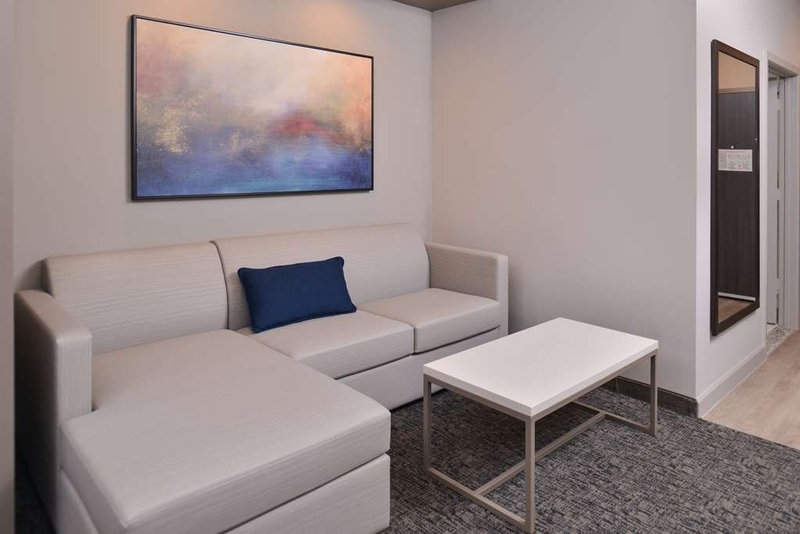 - very nice lobby/ sitting area. It had a very nice relaxing feel. For about ~ $90-100 a night, you do get the "premier" feel and the contemporary design/ theme is refreshing. This hotel was very nice, very clean, and the staff was very friendly! Sharon checked us in and gave us the run down on the amenities of the facility. She was friendly and professional. She also offered us direction to places to eat and visit. 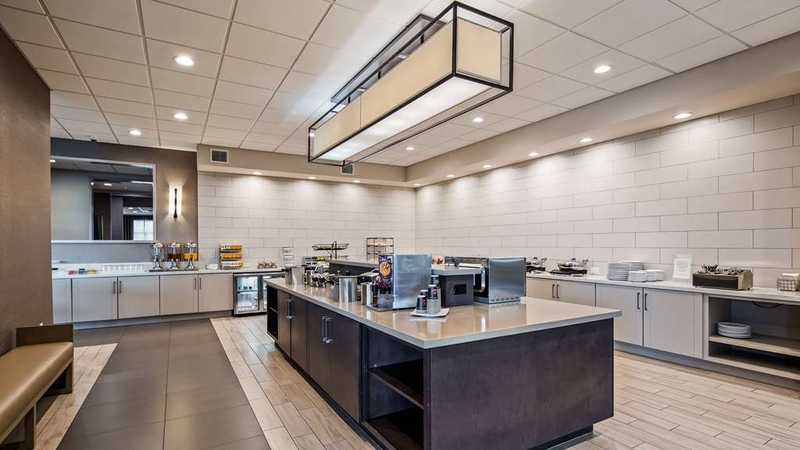 This hotel offers a free breakfast, real breakfast, eggs, bacon, potatoes, sausage, waffles, and a ton of grab and go items, to its guests. The room itself was very comfortable. It had a super comfy bed, a large tv, and very nice upscale bathroom. I am very happy with this facility and experience. We will be staying there again! 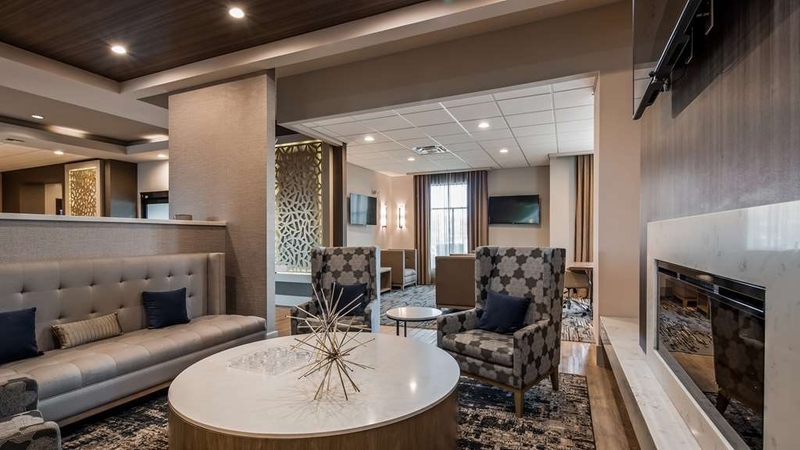 "Special Place with Awesome Service"
I travel every week for business and this new hotel without question is a phenomenal location, great value with excellent service. 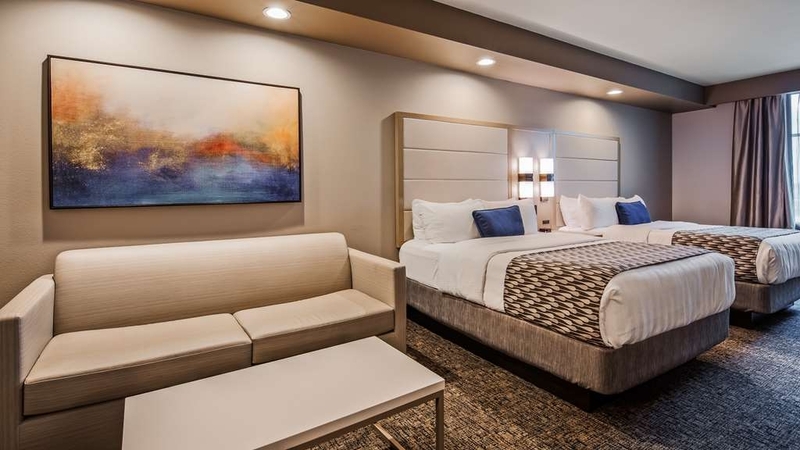 This is my 4th stay and I highly recommend this to business travelers who are looking for upscale accommodations, great service in the energy corridor. I want to personally thank "Andre Smith" for making my stay 5 star. He's always kind, thoughtful and makes the dining experience top notch. The entire staff goes out of their way to make your experience excellent. 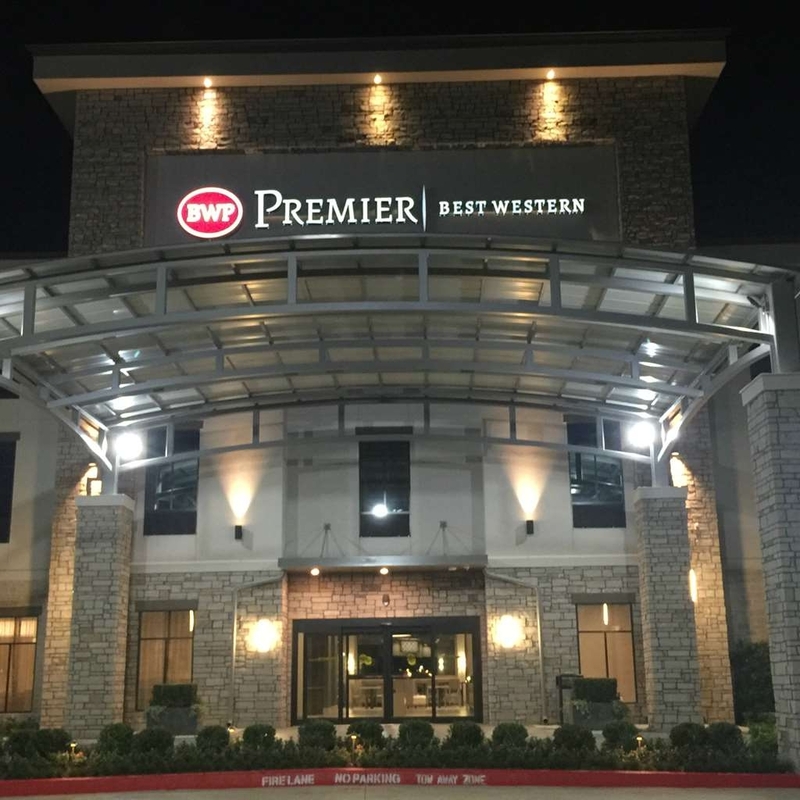 Go stay at Best Western Premiere in Katy!!! New place, nice rooms , breakfast fantastic! Sondos did a really job with the food, anything we asked for she was prompt to bring it! HIGHLY recommended! From eggs, bacon, sausage to potatoes it was definitely worth it! We only were able to stay one night here wish I could have stayed longer. The staff is awesome, the facilities were more than I expected. In a nutshell, for the price, you will not be disappointed with this Best Western. The rooms are so spacious. It was quiet. This hotel appears brand new. Everything was very clean and comfortable. Breakfast had a nice selection. Staff was friendly. Rooms were outstanding...big, beds were comfortable. Will definitely be coming back. We stayed here as we were closing on our home of 15 years and moving into a new home. The service was excellent from the time I called, checked in, during the stay, and checkout. Sarah is wonderful! There's a nice young man that works the front too. The rooms are spacious with a fridge and microwave. Wifi was perfect. Breakfast wonderful. Easy access to Katy freeway and food establishments. They also have a laundry room. You can hook up your Xbox to their tvs. Wonderful stay! Staff and Facilities outstanding. Andre is especially great handling the breakfast entree. He will assist with all requests. Sharon at the front desk is another great Associate who will go out of her way to make sure your accommodations are the best. The hotel is high class. Its is clean and very well maintained. It is off the highway so no traffic noise. breakfast is awesome. the front desk clerk levi and the breakfast employee Andre are amazing. 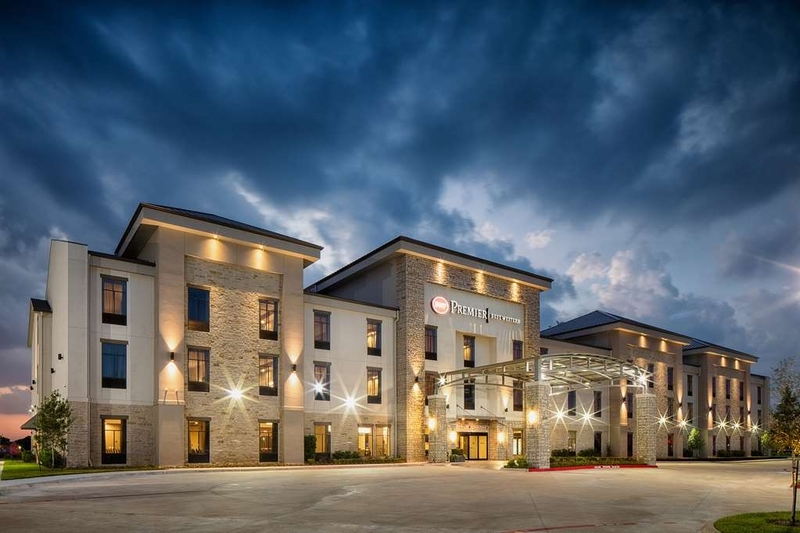 Previously, residents of Katy, Texas, We were pleased to find this new Hotel. We did not know that it was here until a friend advised us that it had just opened in the area. It has a great staff, clean and neat, great breakfast and outstanding decor. It is really obvious that they put time, effort and thought into the Hotel. Levi was polite and nice when checking us in and very helpful. Andre was especially kind. He cooked poached eggs which I absolutely love and the attention to the food set up and the quantity was more than above the normal service. He is a gem. The rooms are spacious and nice. The rooms have great lighting, plush beds, soothing colors, large well lighted showers and excellent vanities and well thought out use of appliances . Fantastic Accomodations!!!! "Best place to stay on the west side of Houston"
Great location. prices. room. food. people. and now adding a bar.. Everything was well thought out and the people working there were wonderful. Great design (kind of0 Modern/Deco style) with tasteful colors. The room was great, the bed was perfect and the bath was spacious. Andre Smith was the man helping with the breakfasts and both the food and Andre were far beyond my expectations. I love this place and will always stay here when passing through Houston. everything was great! The staff, breakfast, especially the pool. Felt very comfortable and welcomed since day 1 (stayed for 4days). Sharon, Sara, Andre, Levi, Natalie all did great with being hosts and provided great customer service! Andre Smith is the chef and he is good at what he does! Makes some bomb food! The rooms are nice and so is the staff! I will stay here every time I come to Huston! Nice new and cheap what else could you ask for? "Amazing ultra modern contemporary accomodations"
This hotel is extremely well appropriated. The contemporary decor is gorgeous. 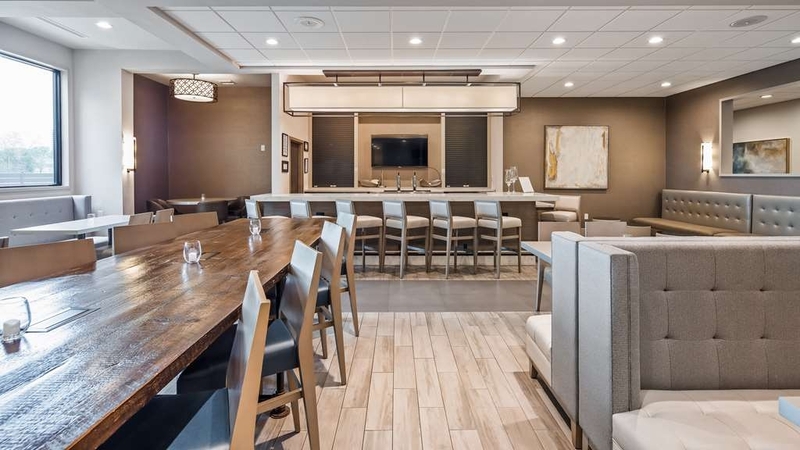 The amenities are professional and full service with a beautiful fireplace lounge, high tech business center, an abundance of meeting spaces and an amazing dining room and liquor bar with incredible full service breakfast bar including omelette station. Make sure that you meet head Chef Andre Smith. His food is fabulous and he makes every early morning pleasant and welcoming. The front desk and housekeeping staff are accommodating and kind. 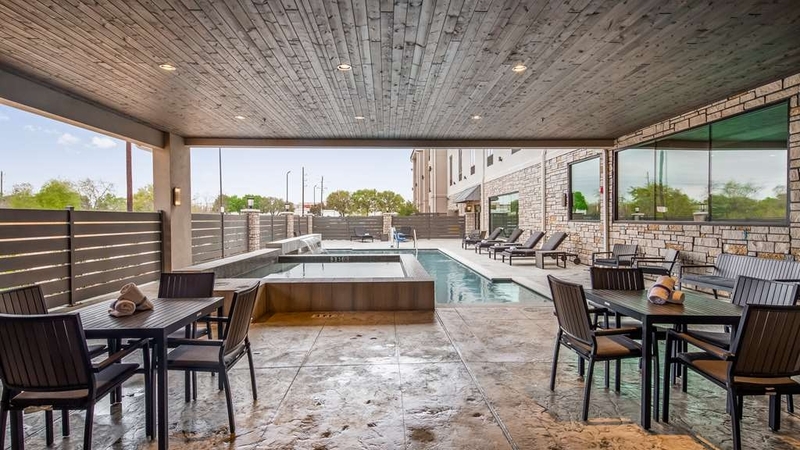 The pool and sauna are gorgeous with lots of patio space and lounge chairs right off a fully complemented exercise room with towel and water service. The king rooms are spacious with very comforatable beds, top end glass door showers in the baths and classy finishes. We could not have been more impressed with this hotel. "One of the Best Hotels for me." very clean, very comfortable beds, easy access to all major roads and surrounded with great restaurants. It has everything i needed for a hotel which made me not miss the comfort of home. It has the feel of a high end hotel for a great price. This is a brand new hotel! We stayed for a music conference. These rooms are HUGE!! The rooms have modern furnishings with stainless steel mini fridges and microwaves. Breakfast was a nice and hot buffet style, along with a chef to cook your eggs any way you like them. The staff is just amazing! So friendly and caring! We will definitely be staying here any time we are in this area! "Clean, friendly, and just plain amazing"
A modern looking hotel - very chic. The front desk lady, Sharon, was extremely helpful, especially when I forgot some cosmetics. The rooms of course were very clean and spacious. Highly recommend this place. 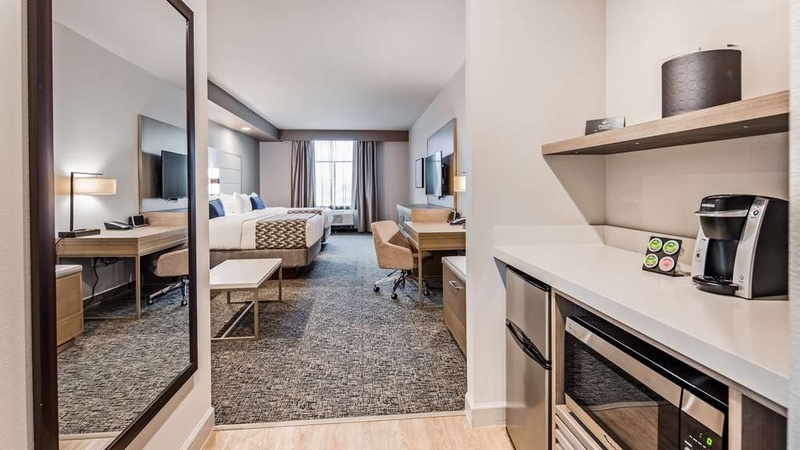 "Best Western Premier Energy Corridor"
Brand new hotel so everything is immaculate. The staff is pleasant and courteous and the rooms are spacious. I especially enjoyed breakfast every morning. Andre Smith made sure that everything was perfect. I highly recommend Best Western. "Brand new hotel - stay here!" 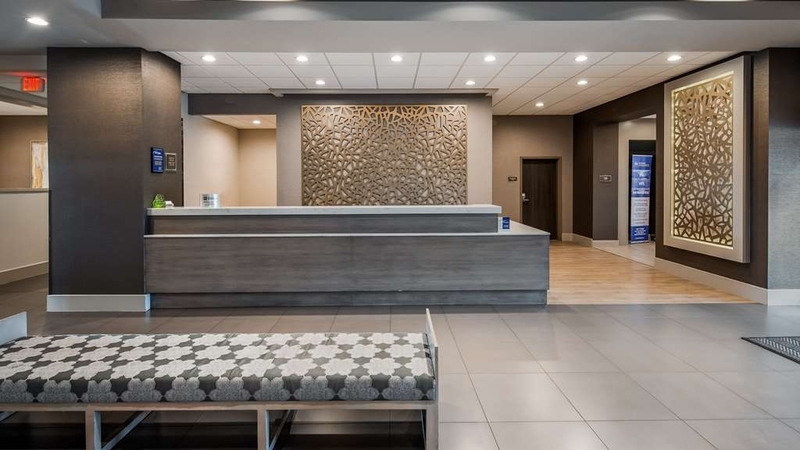 Gorgeous new hotel - beige/grey decor with marble look counters. Modern Kohler fittings. Rooms are very large with stainless steel fridge (and freezer) and microwave. Keurig coffee in room. Free coffee and cookies at reception. Pool is very trendy with under water lights and hot tub. Breakfast was good - eggs, waffle maker etc. Above all the staff were very pleasant and helpful. In particular Levi and Sarah get 2 thumbs up. Definitely I'll recommend and return if I'm in Katy again. Also there are several good restaurants within walking distance and also lots more within driving distance!! 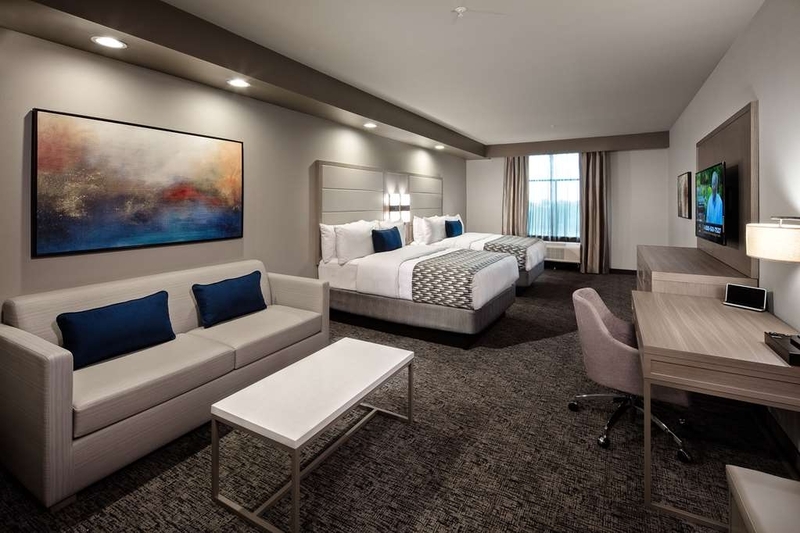 We book our one night in Katy, Houston in Best Western Premier Energy because they offer the lowest price in compare to similar hotels in the area. They offer very nice and clean room. Breakfast is boring with limited plate (only some eggs, bacon, bread, yogurt, milk and pancake) We book our rooms via Otbitz (120 dollars tax included) but when we arrive, the reception asks for 25 dollars in addition for authorization fee. Very upset. The breakfast selection was very good, its a new hotel so they are still getting breakfast items. The rooms are very big and have alot of room that you more than likely wont use unless you have 4 or more people staying in it. Stayed last week of September 2016. Being new the hotel was pretty low occupancy. 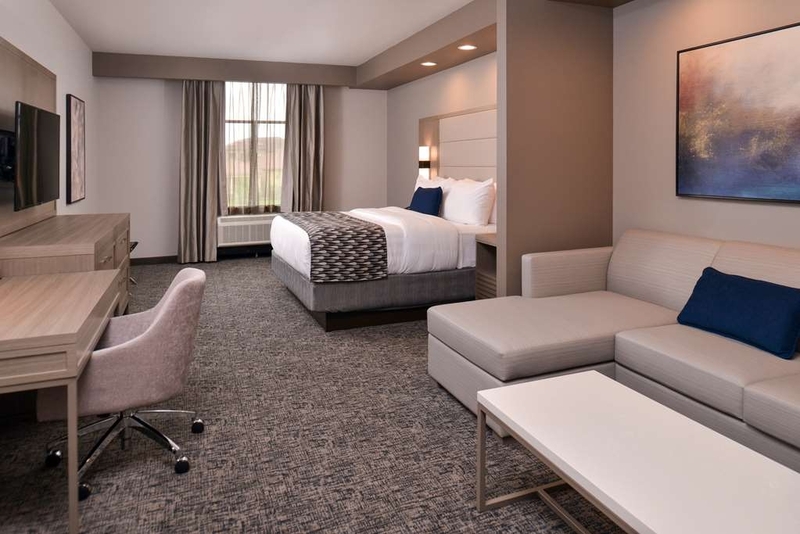 Comfortable and spacious rooms. The free wifi was reliable and easy to connect to. Enjoyed the pool and hot tub area to relax in the evenings. Having a small fridge (with freezer) and microwave to have some small meals in your room was convenient. Coffee and cookies seemed to be available in the lobby all the time. Guest laundry is available ($2 wash/ $2 dry), unfortunately they did not have any detergent at the time. Walking distance to a few restaurants around, although you have to walk on the grass or in the road...no sidewalks. The sitting area is nice to have, although the couch is rather plastic feeling so not the most cozy to curl up on. This is a newly built hotel I enjoyed my stay there. This is my second time staying there. I love the rooms are beautiful and spacious. Front desk staff is always friendly and helpful. The breakfast that is prepared every morning by Mr. Andre Smith is wonderful. The kids enjoy the waffles with the Best Western on them. 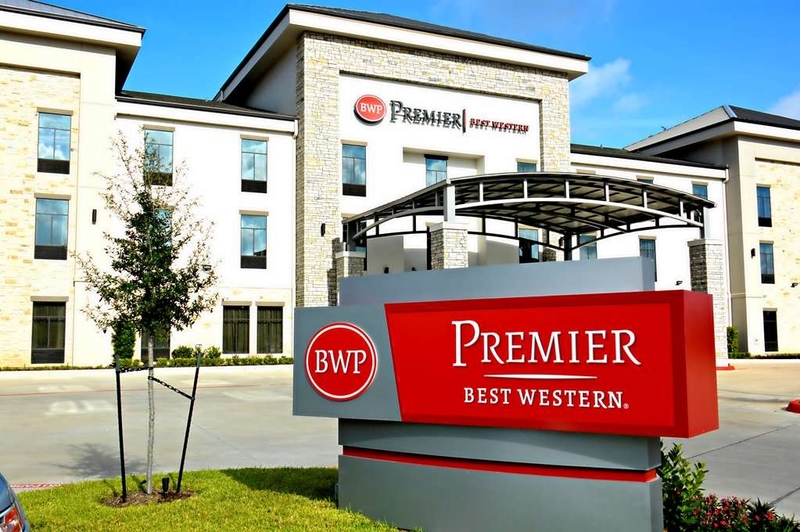 So if your looking for the best hotel in Katy the Best Western Premier is your destination stop. First person to occupy this brand new room woot woot!! I was impressed at how spacious the room was!! 2 great bigbcomfy beds..a lot of room..amenities, etc. The front office staff friendly and accommodating...I will stay just because even tho I live right across the street but I felt like a queen there...so why not?! So happy I found an awesome place for my family and friends when they visit the Katy area!! "Best hotel in the Energy corridor area"
We stayed here for three nights and were really impressed with the service and the cleanliness of the rooms. The breakfast was excellent, with an omelet station, bacon, and real sausage ( not loaded with fillers like at some other hotels). The staff was very helpful and accommodating. The rooms were very spacious, and the location was great. Close to the freeway but far enough away to be quiet, with many restaurants within walking distance or a short drive away. We will definitely stay here again. The staff was super friendly and helpful. The king bedroom was very spacious and everything was super clean. The breakfast had many items to chose from, including hot items. The swimming pool was amazing and the gym had plenty equipment to offer. WiFi was pretty fast and TVs are equipped with DirecTV and offer plenty of channels, including premium channels. Overall the hotel is pretty high end, will definitely return. 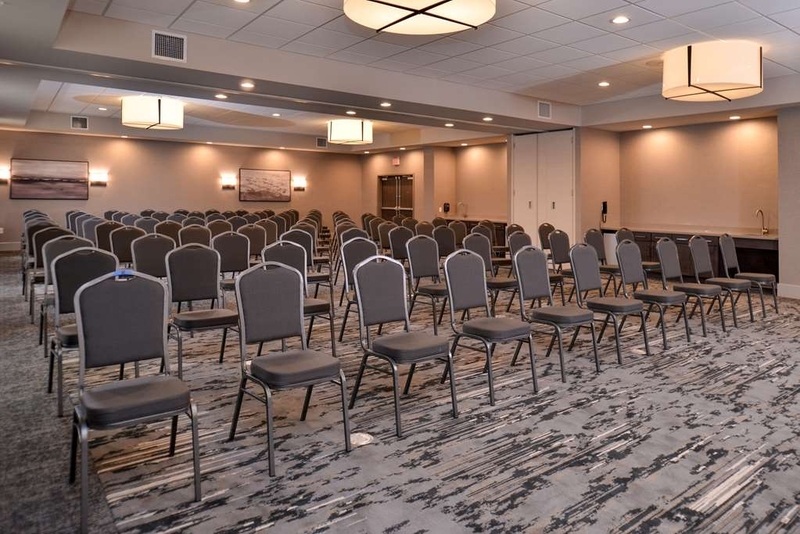 Great place, clean, very organize and friendly people, price you cant beat, they have a chef and personal request available, amazing pool, and big gym, no hotel around have many amenities like this hotel. 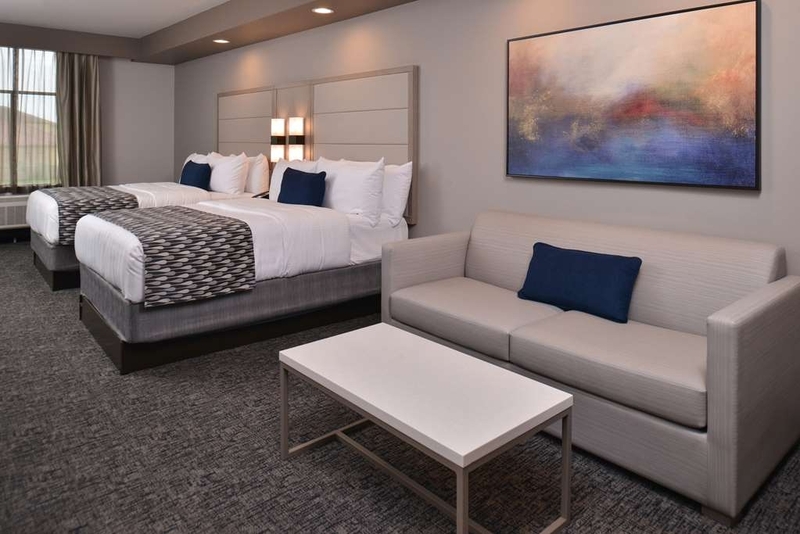 "Pretty high end and was shocked with the level of attention by the staff"
My king bedroom suite was very clean since it all looks brand new. The room was spacious and very nicely decorated. The front desk staff were always pleasant and helpful. The girls at the desk helped me find a nice place to eat around town.